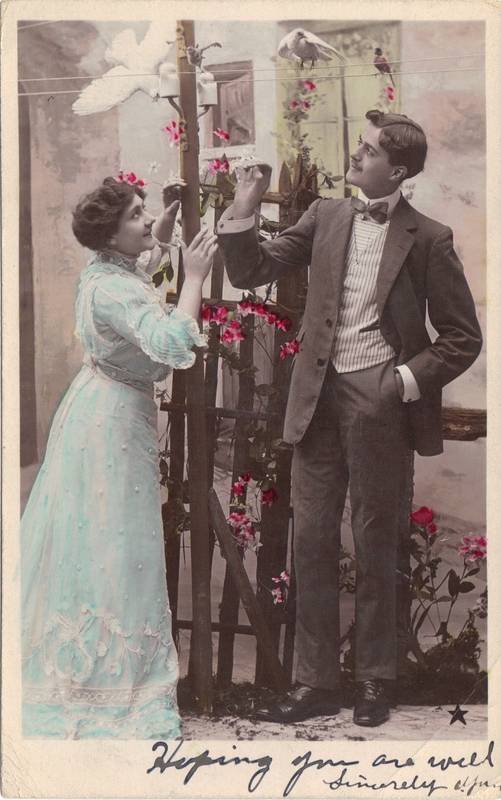 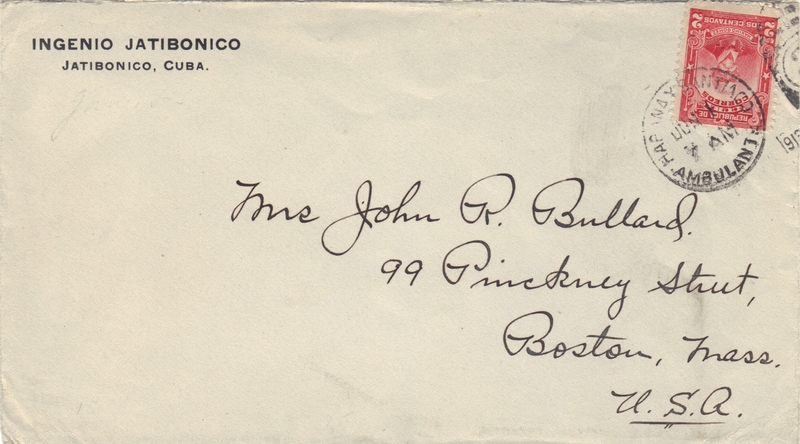 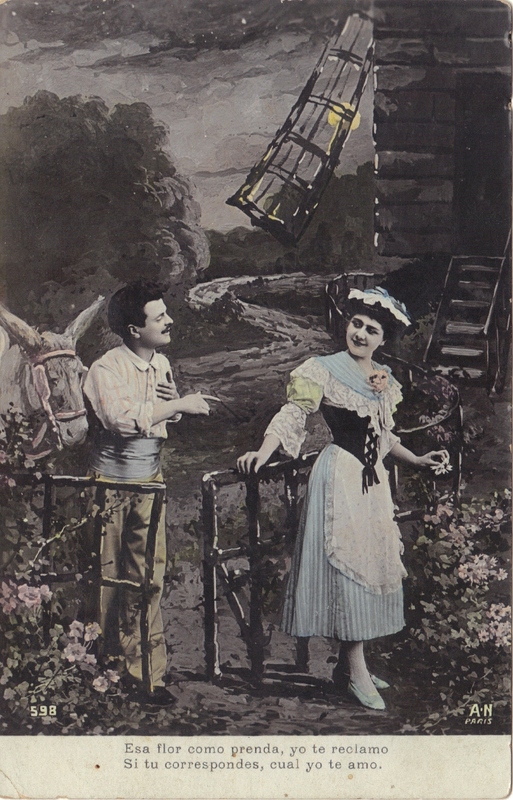 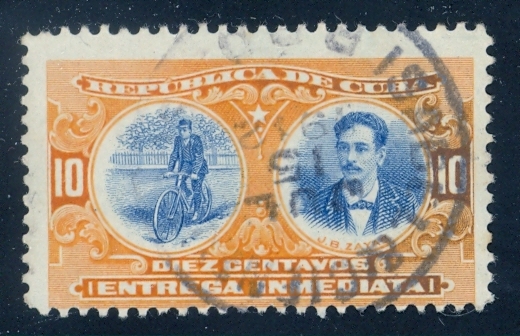 1104A - Habana y Colon Ambulante, 1908. 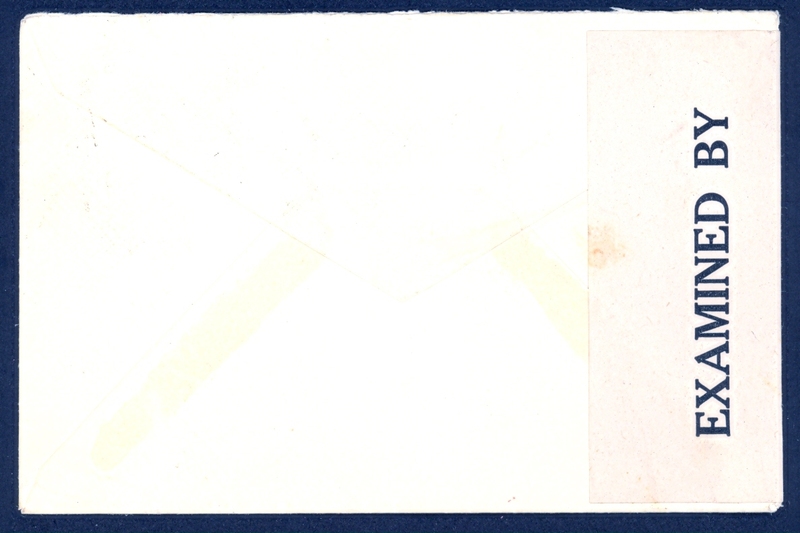 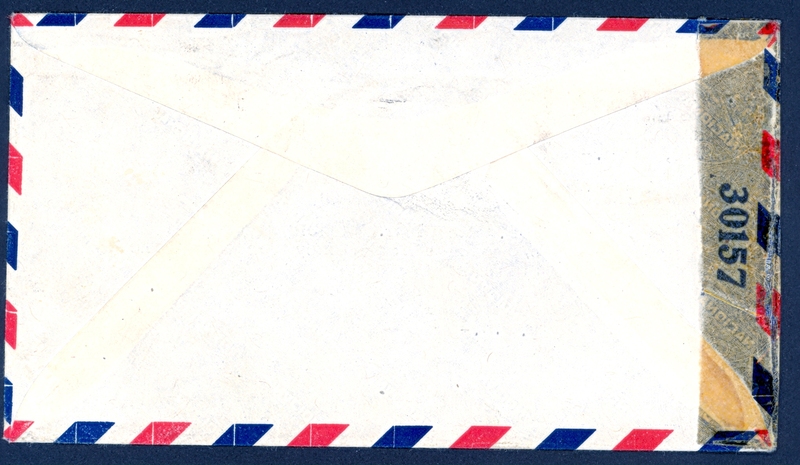 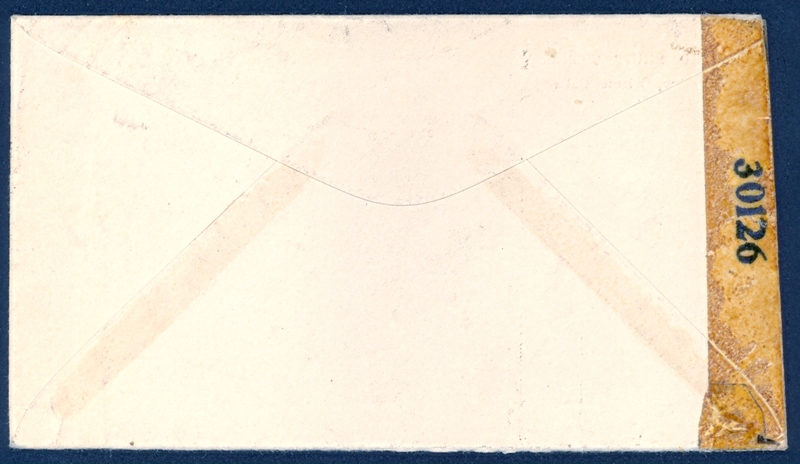 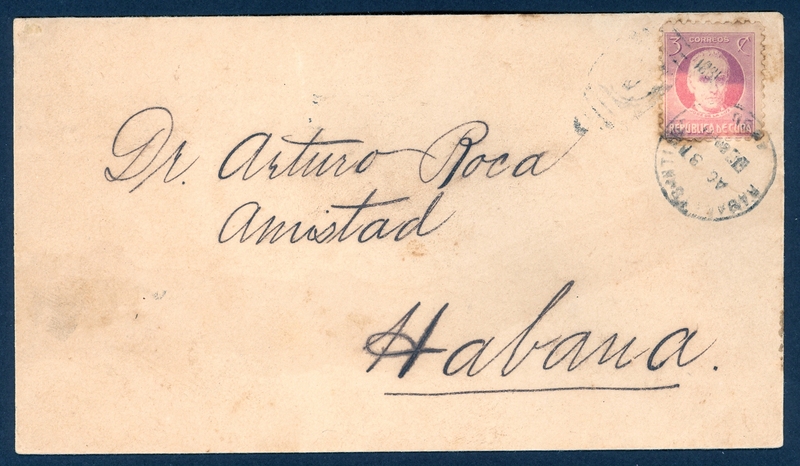 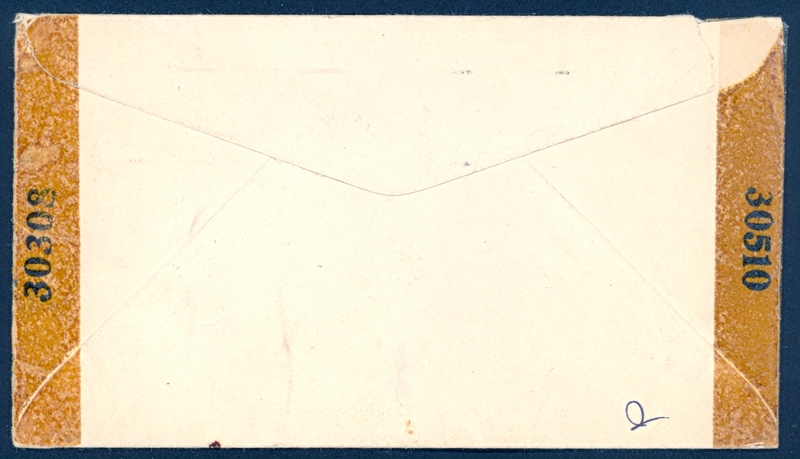 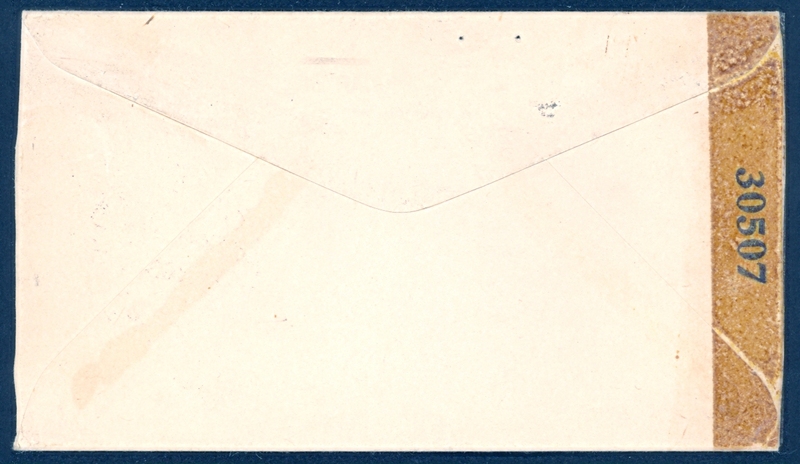 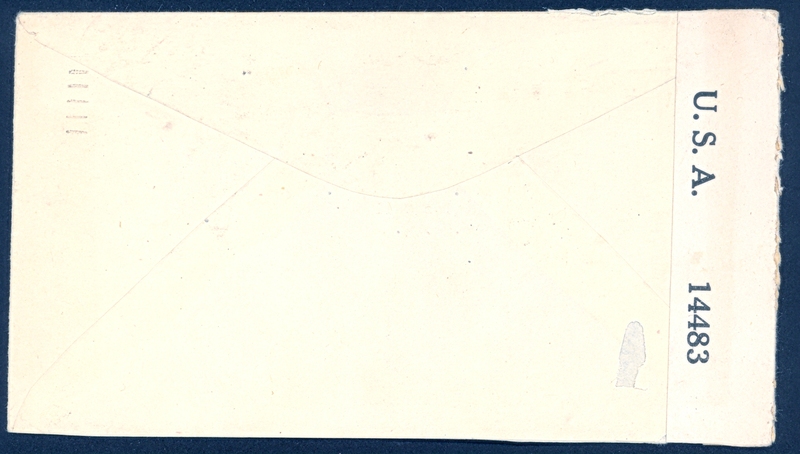 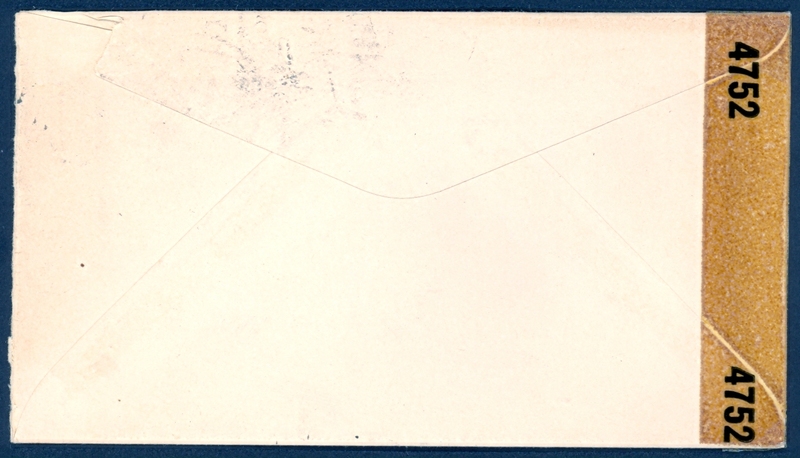 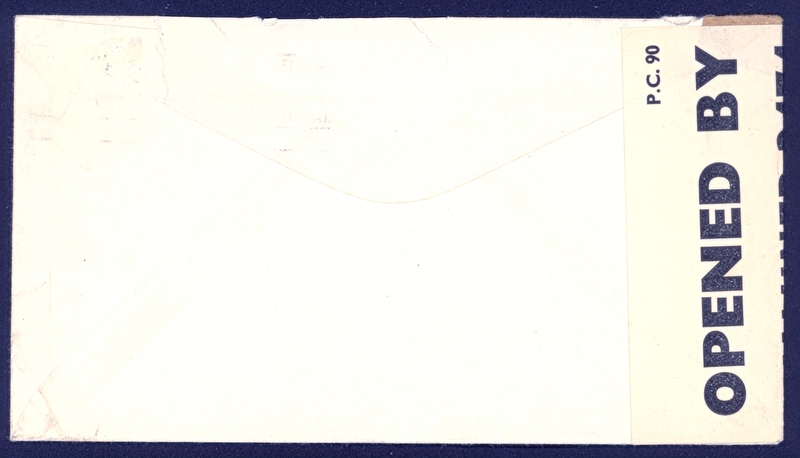 - Scott 12 Via coastal steamer "Comanditario" - Habana to Manzanillo folded letter, August 11, 1864. 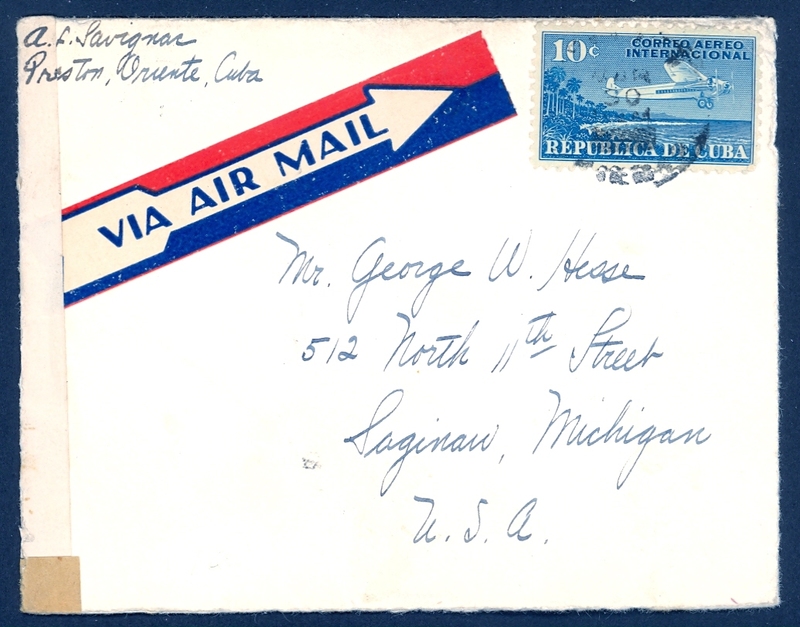 - Go to Lot 648 to bid. 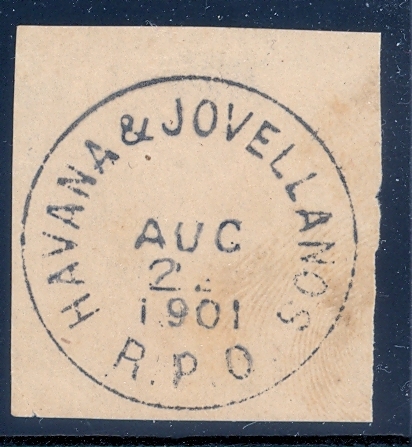 Vaya al Lote 647 para pujar. 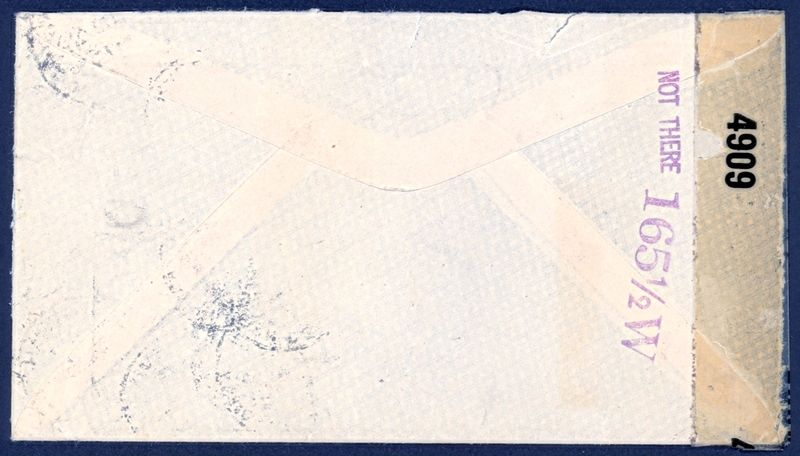 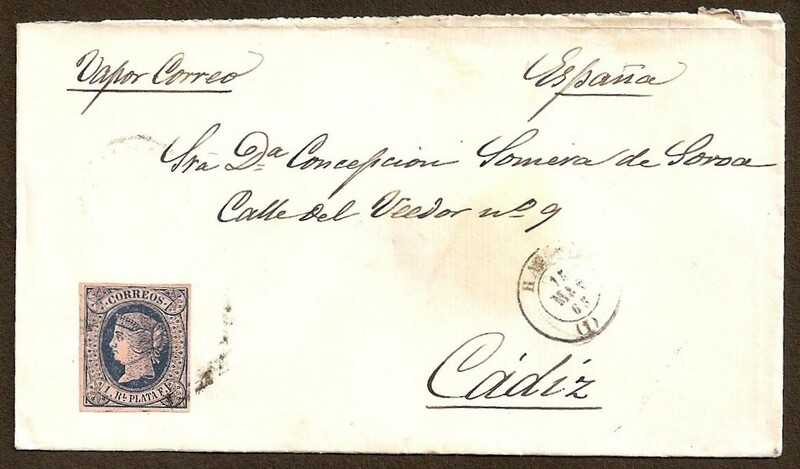 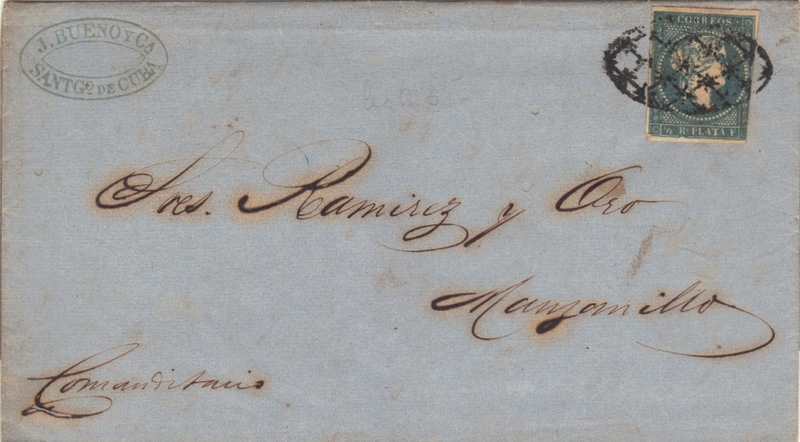 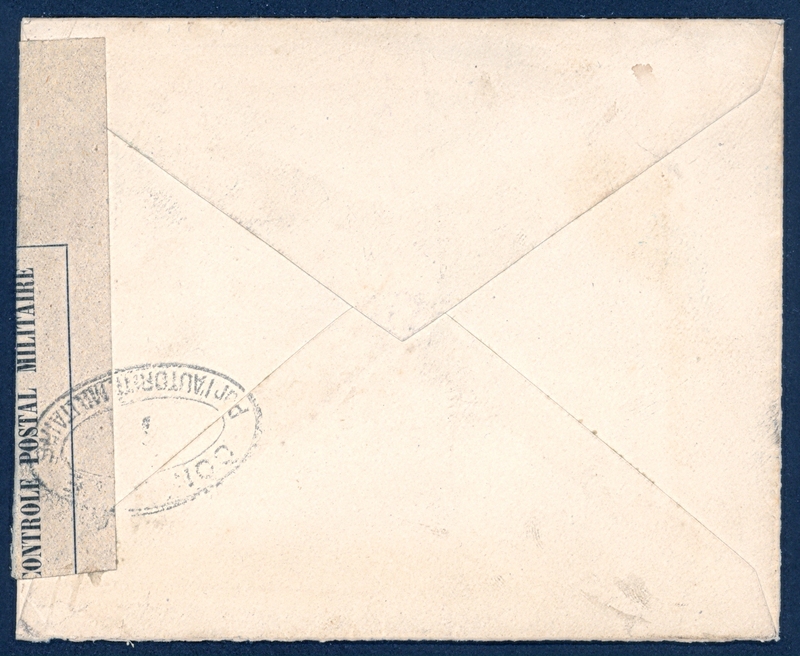 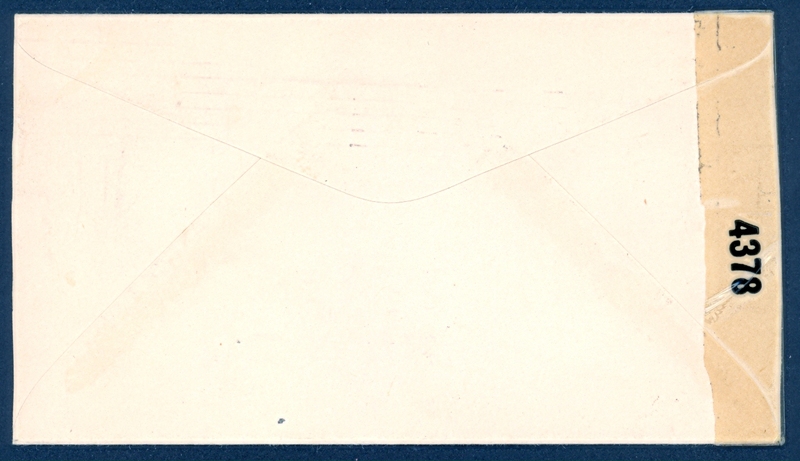 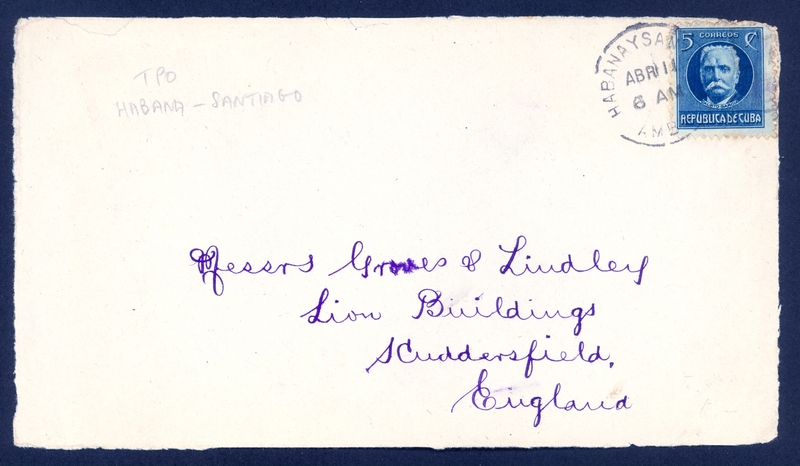 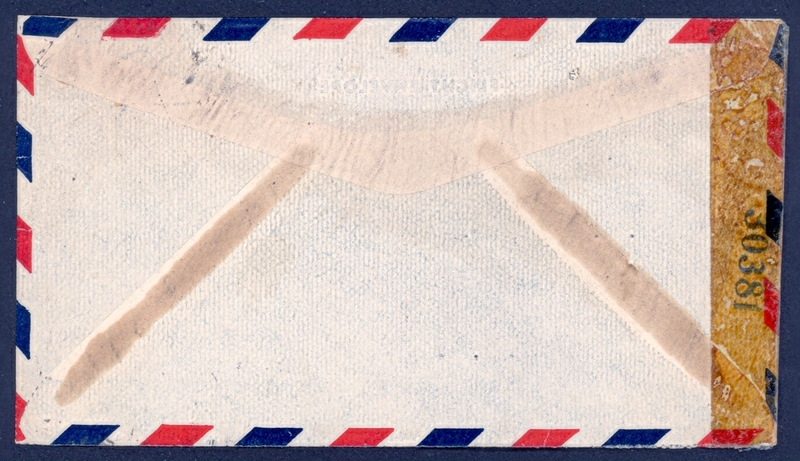 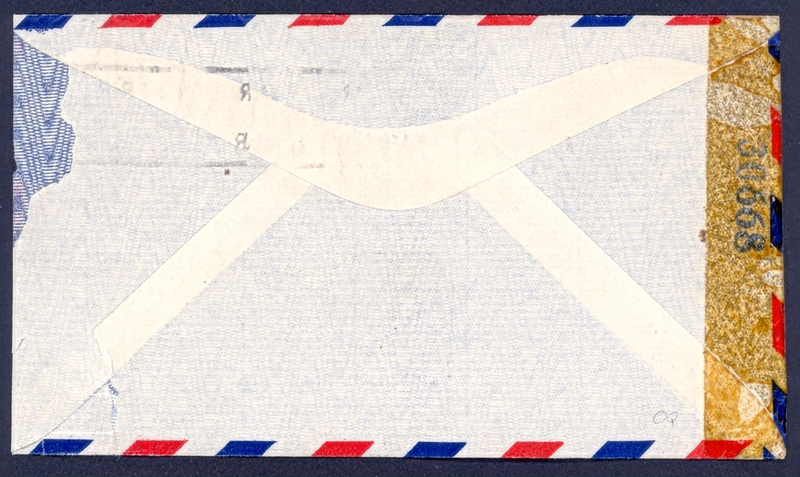 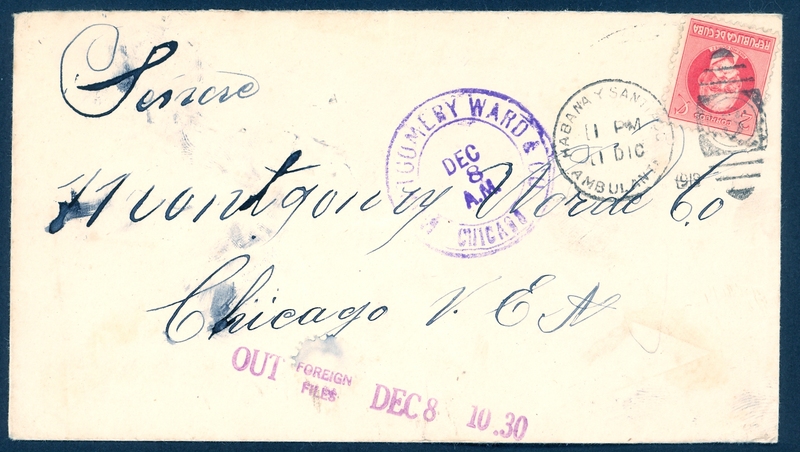 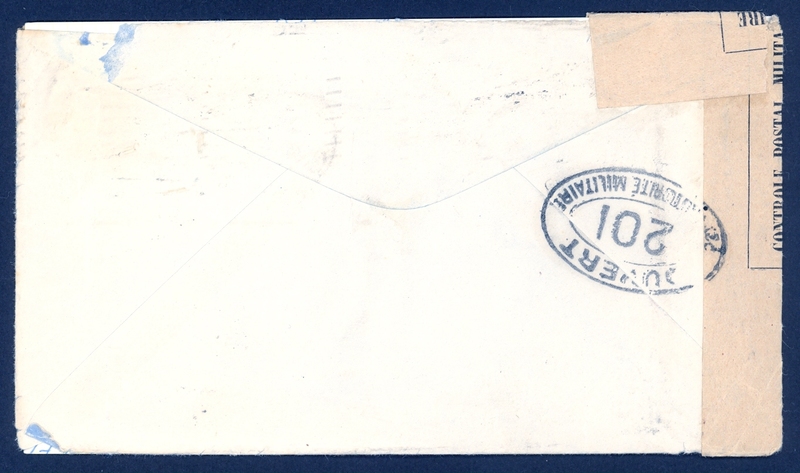 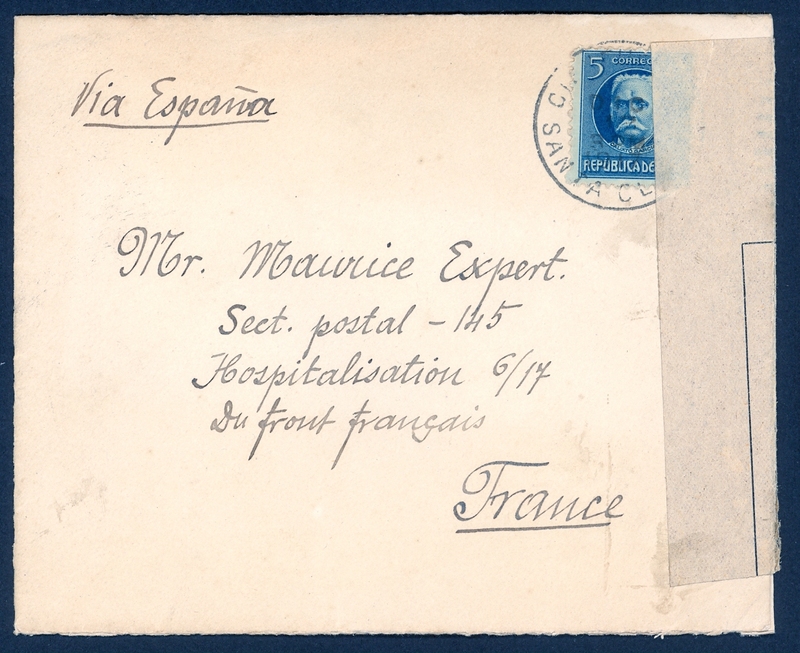 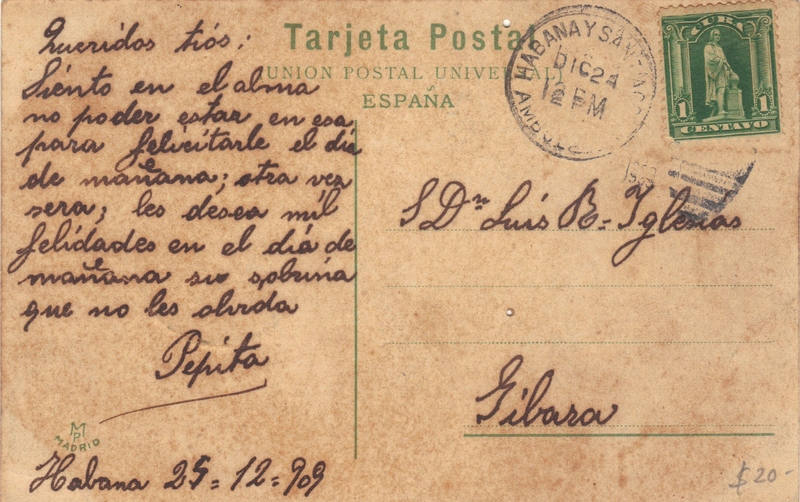 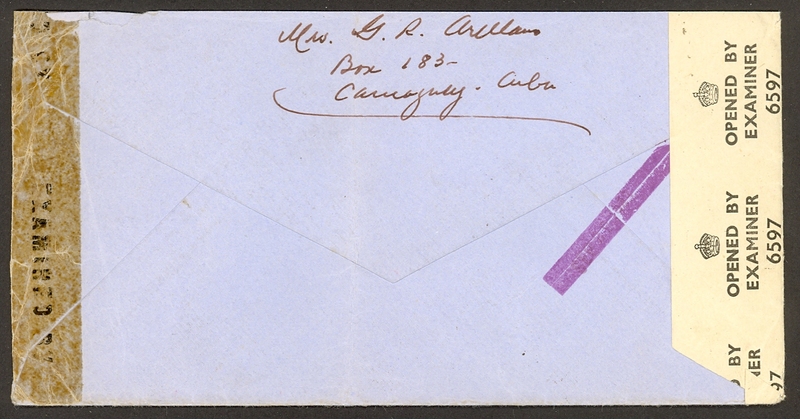 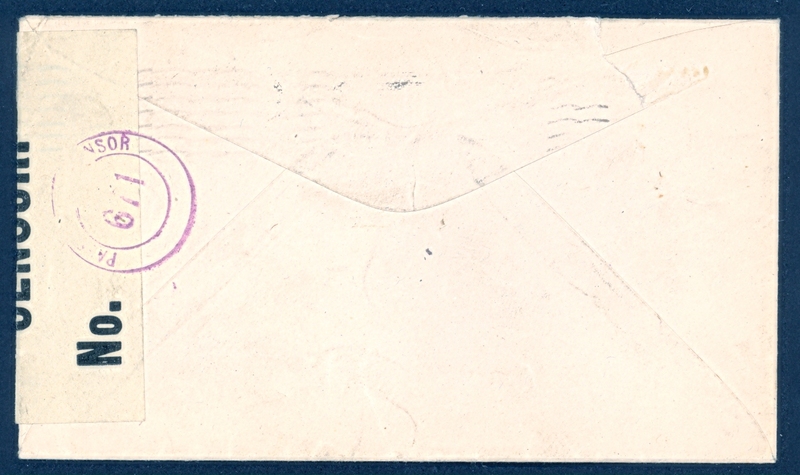 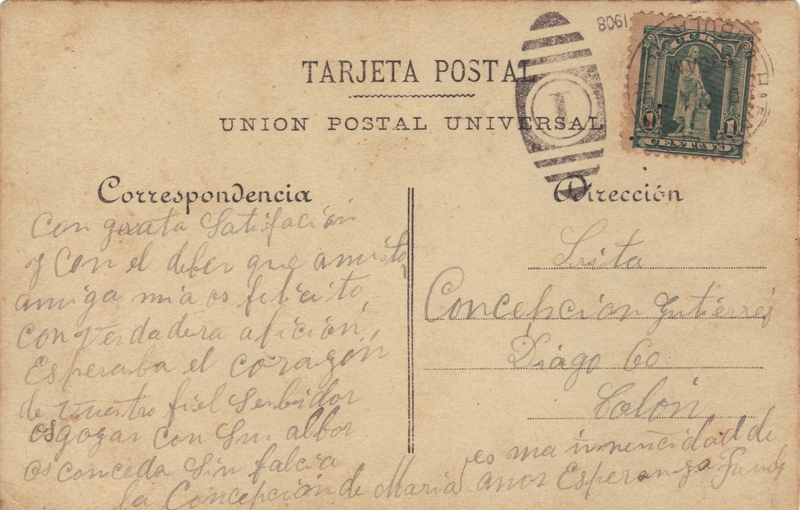 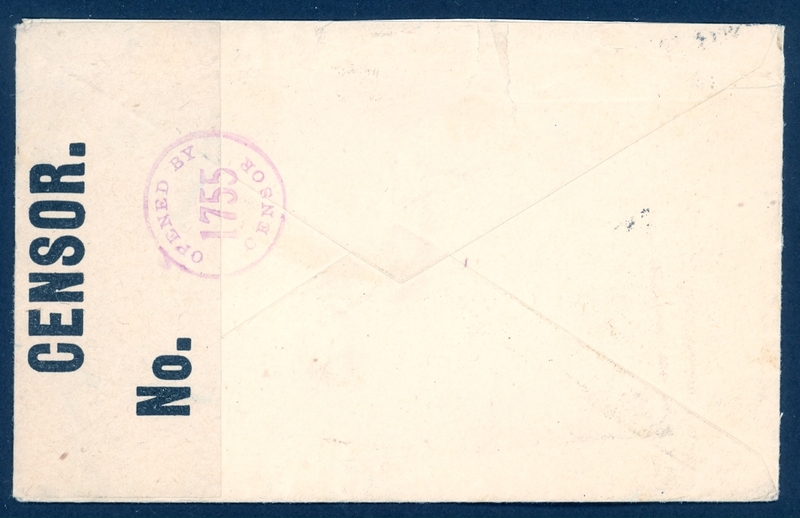 - Scott 20 Cover to Cadiz por Vapor Correo, 15 Mar 1865. 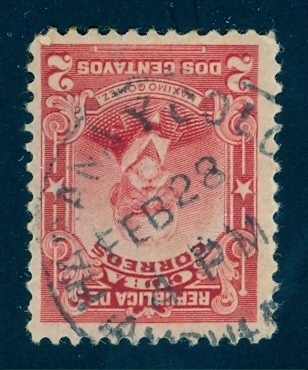 - Go to Lot 656 to bid. 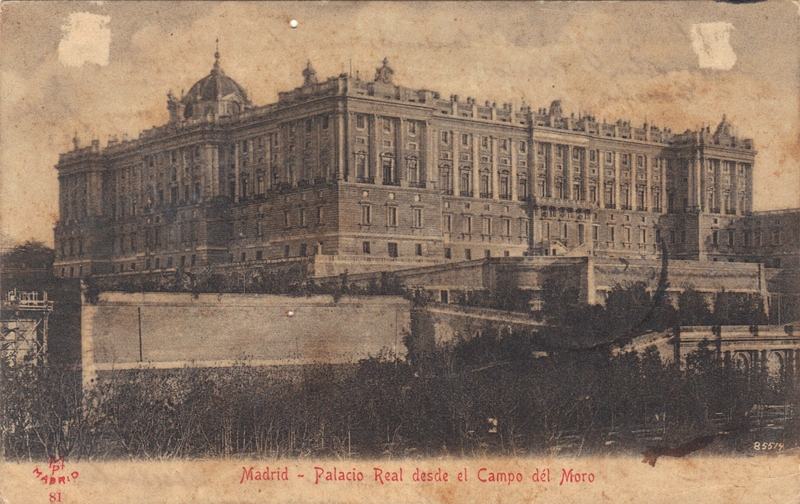 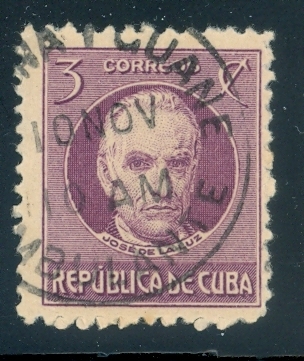 Vaya al Lote 656 para pujar. 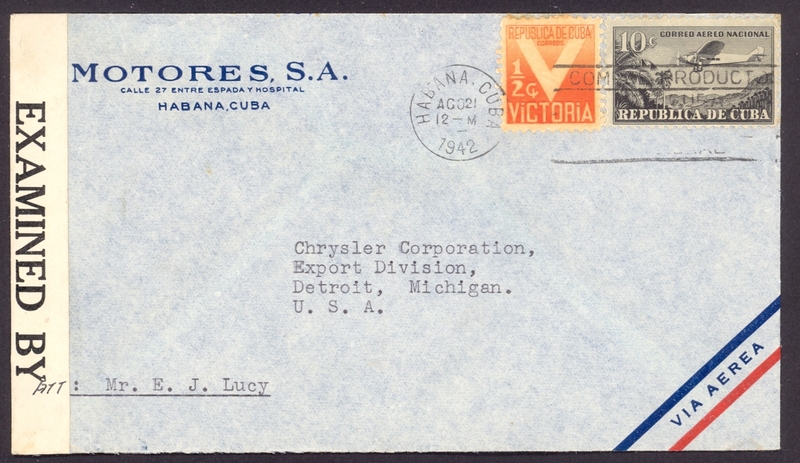 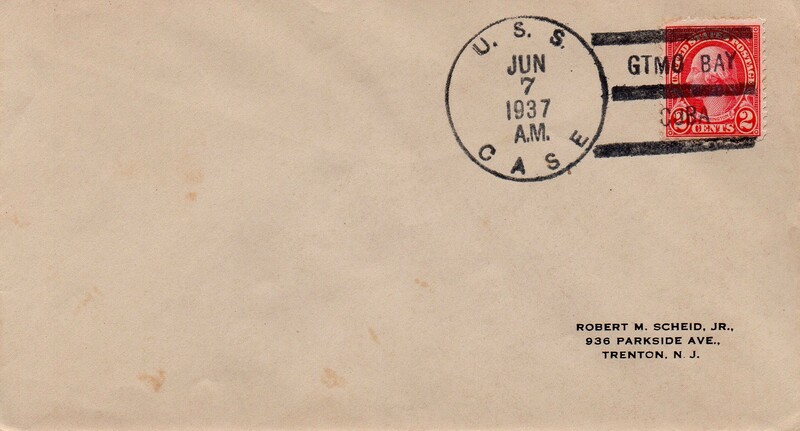 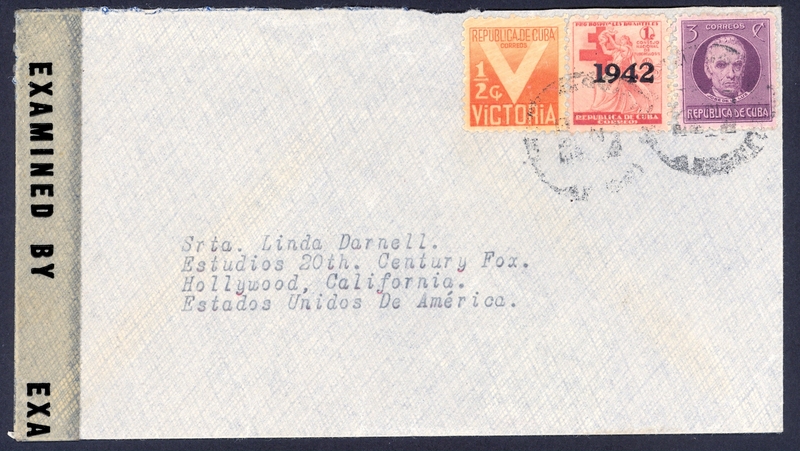 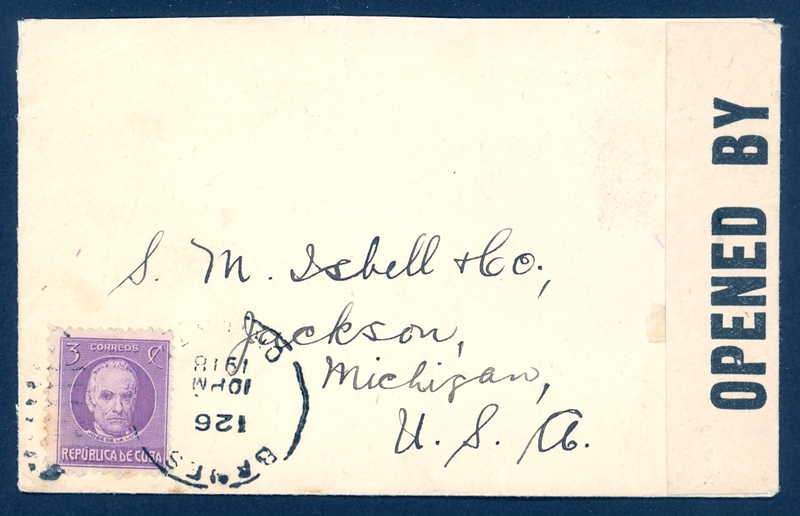 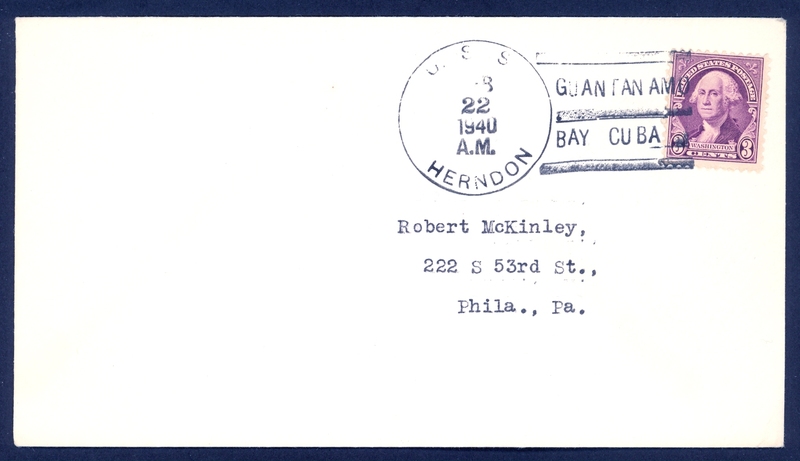 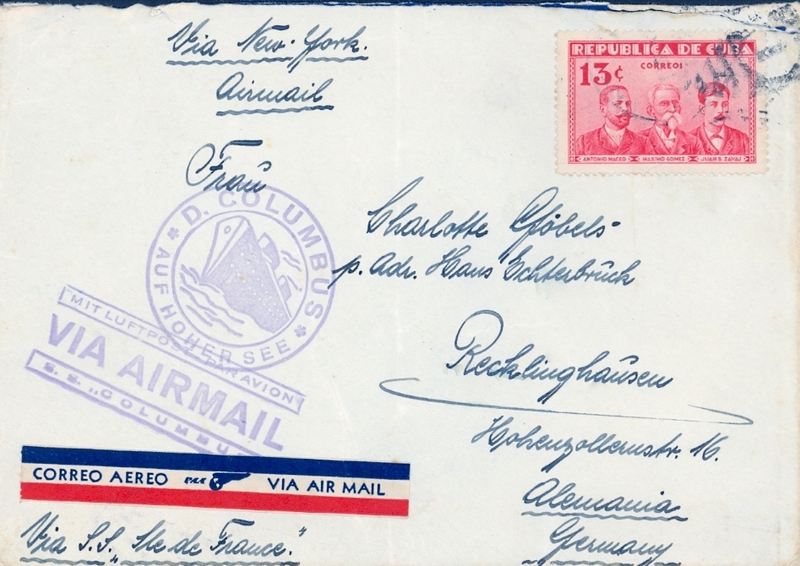 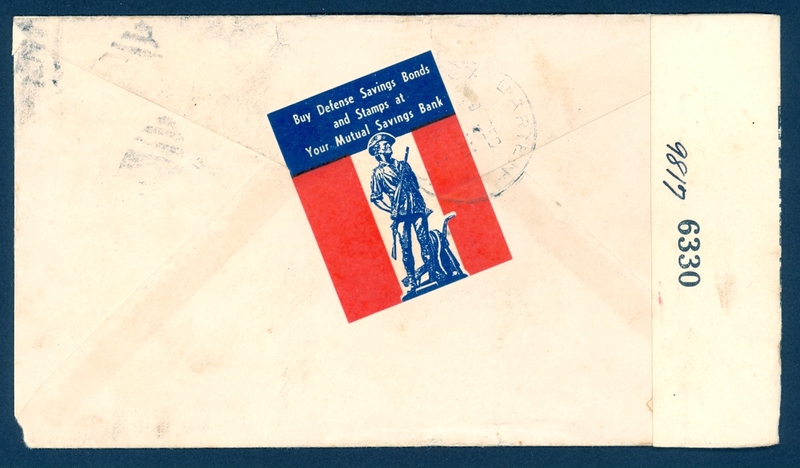 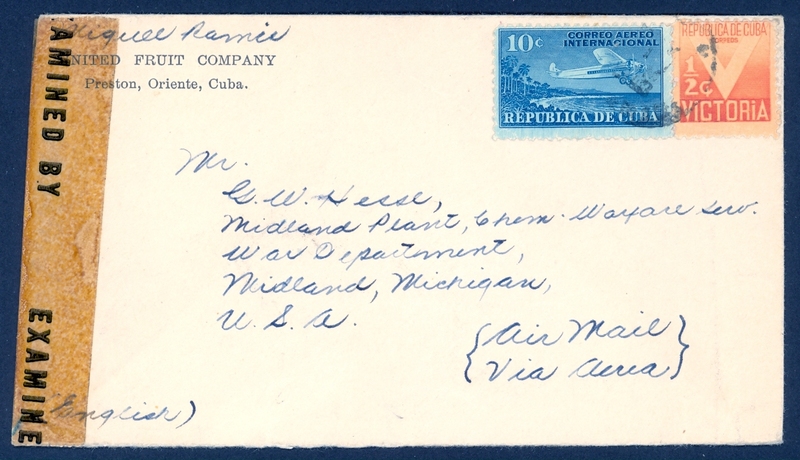 NY & Cuba Mail SS Co.
1155 Scott 267 Sc 267 on WWII censored cover from Banes to Michigan. 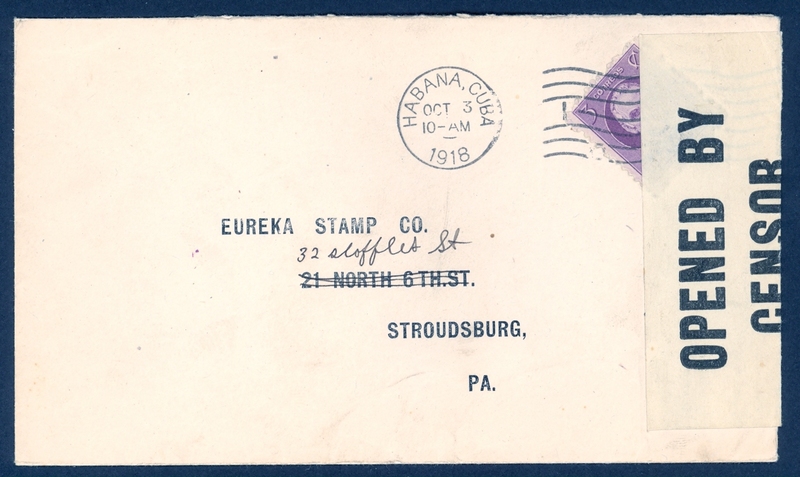 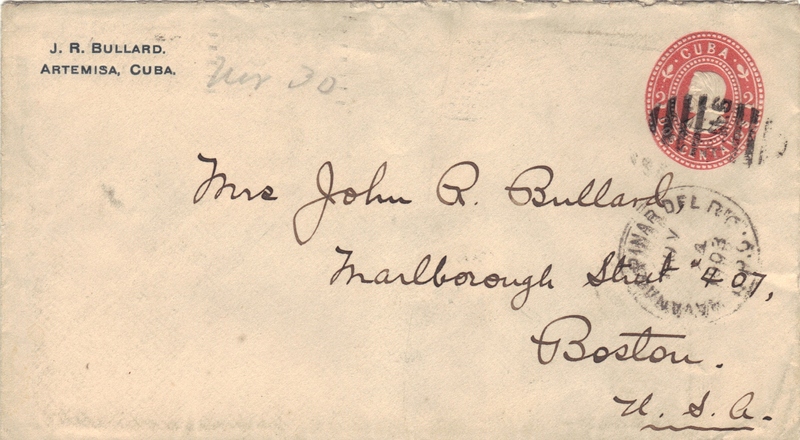 1156 Scott 267 Havana to Stoudsburg, PA WWI US Censorship. 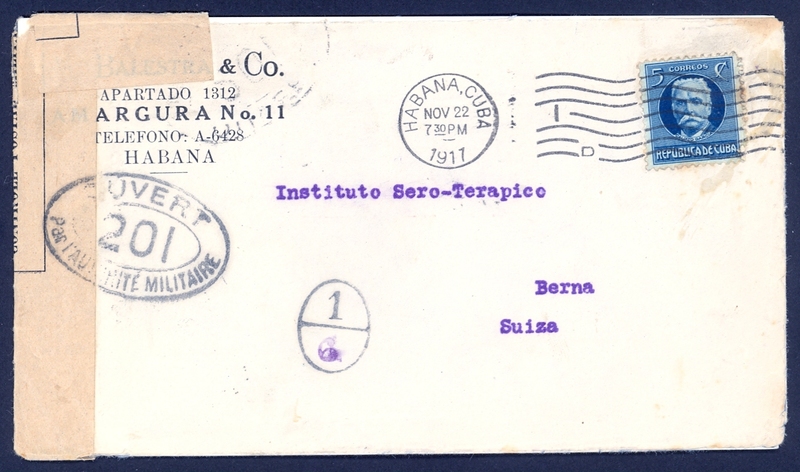 1157 Scott 268 Havana to Switzerland, WWI Swiss Censorship. 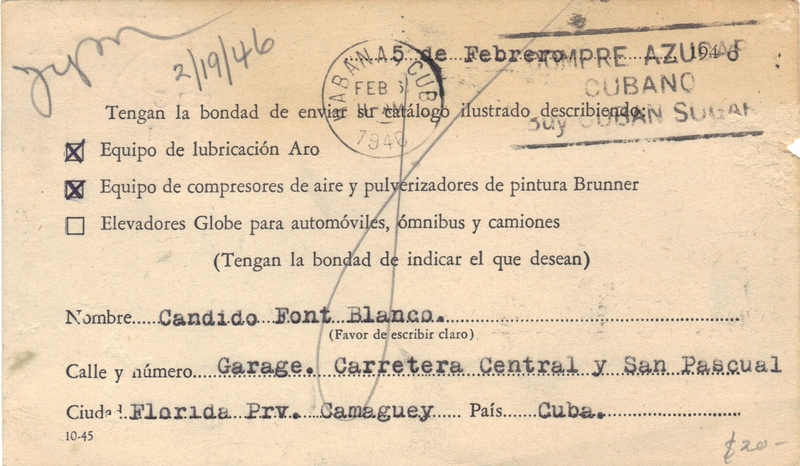 1158 Scott 276 Cienfuegos to France, WWII French Censorship tape. 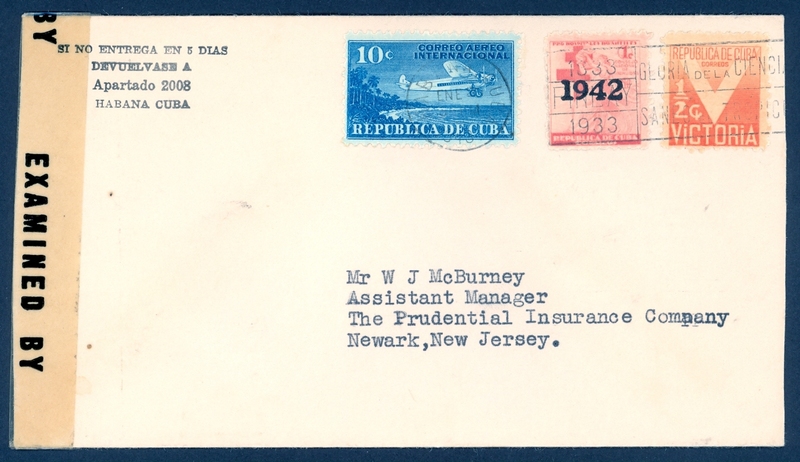 1160 Scott 310(4), RA5 Havana to New Jersey, WWII US Censorship. 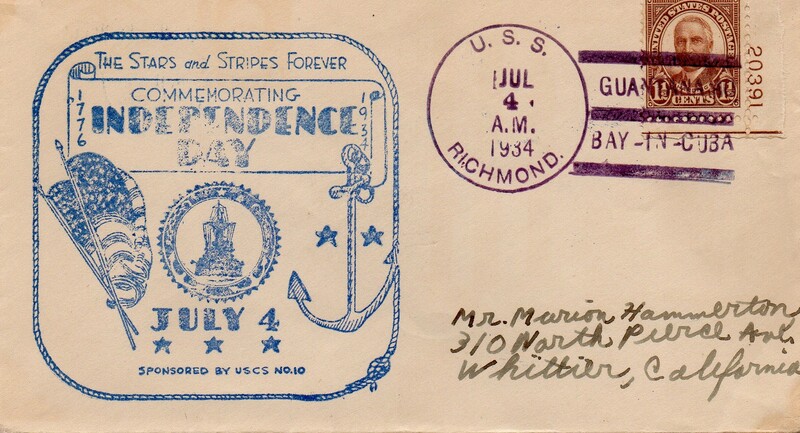 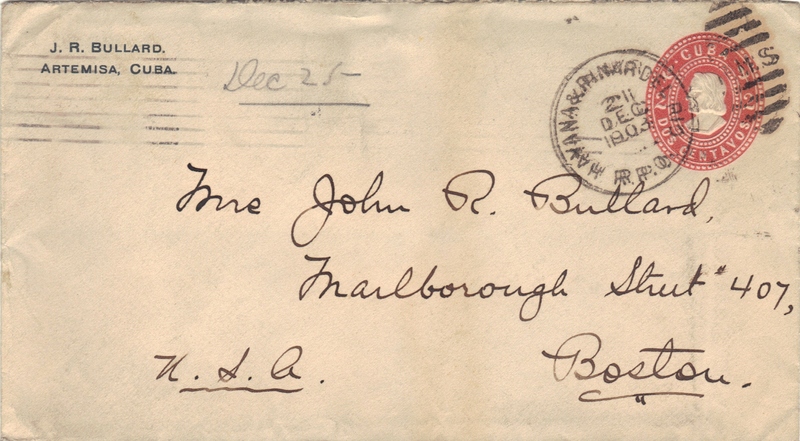 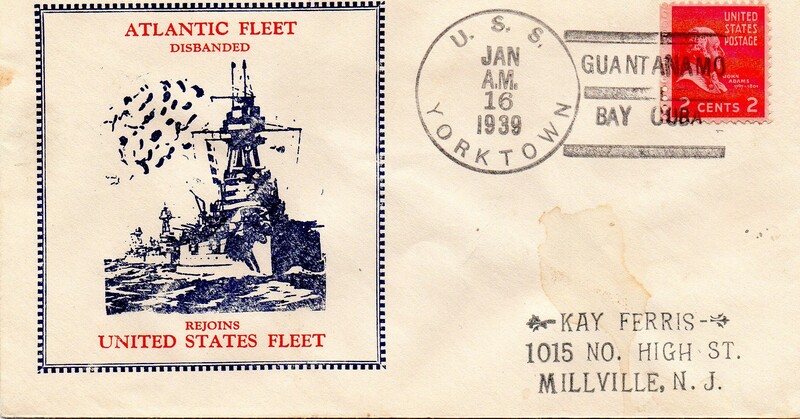 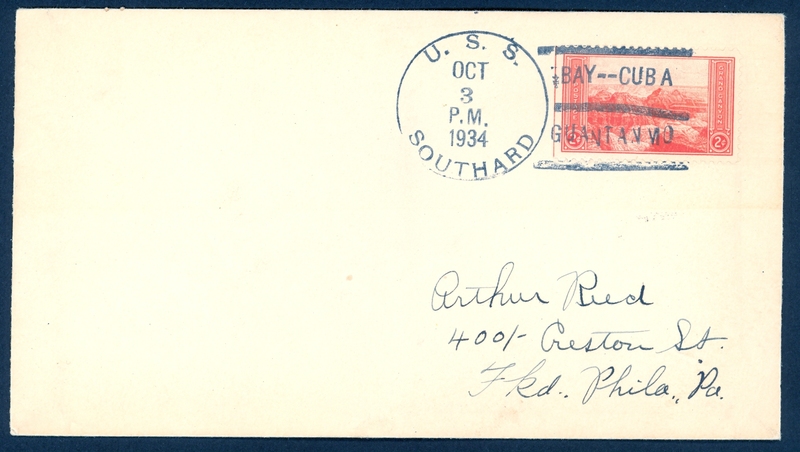 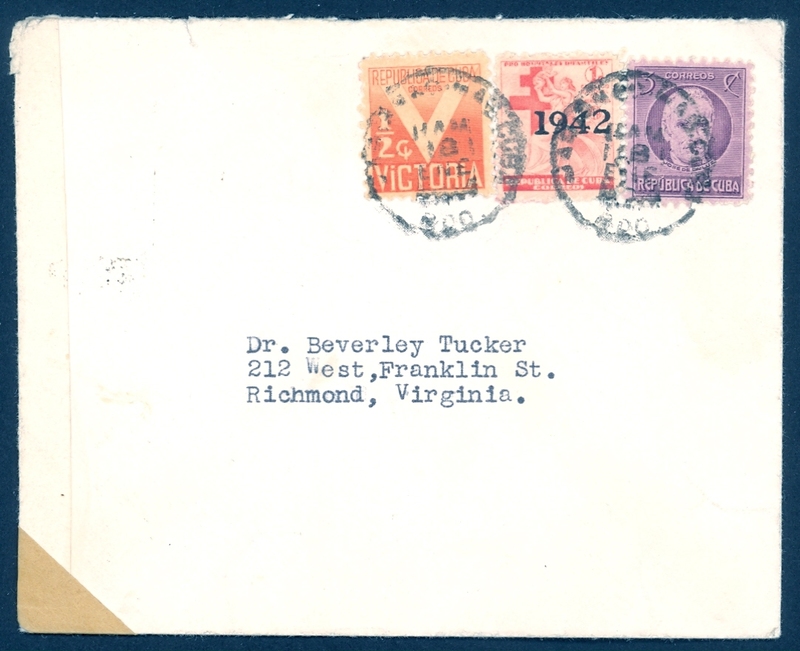 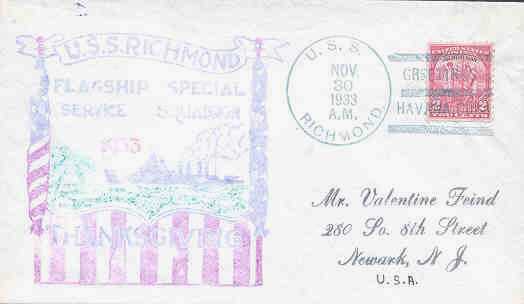 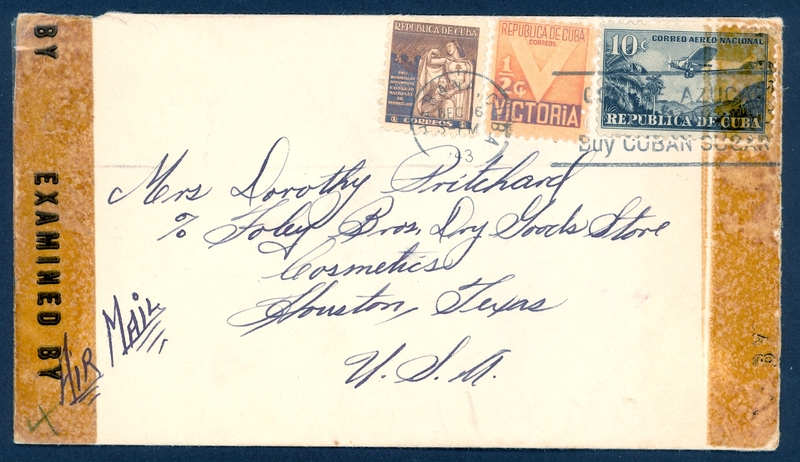 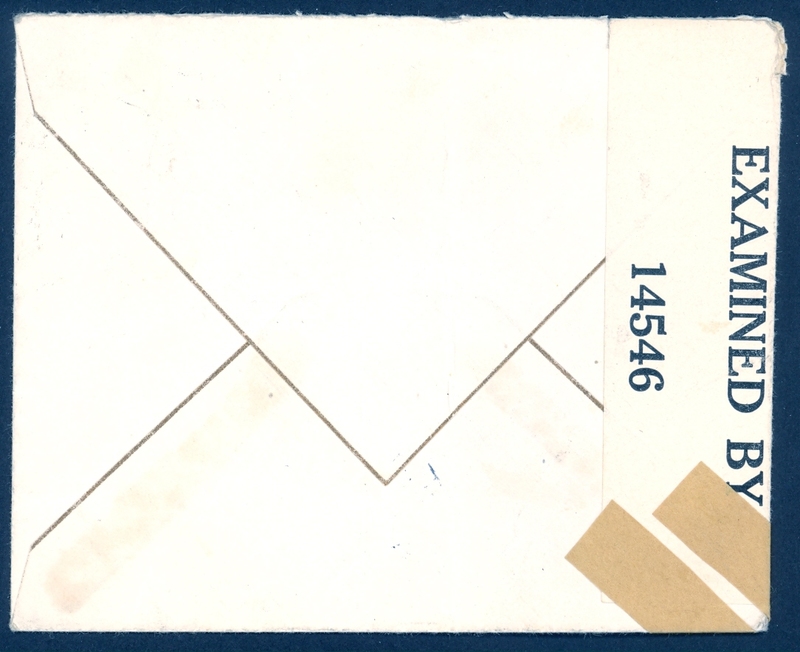 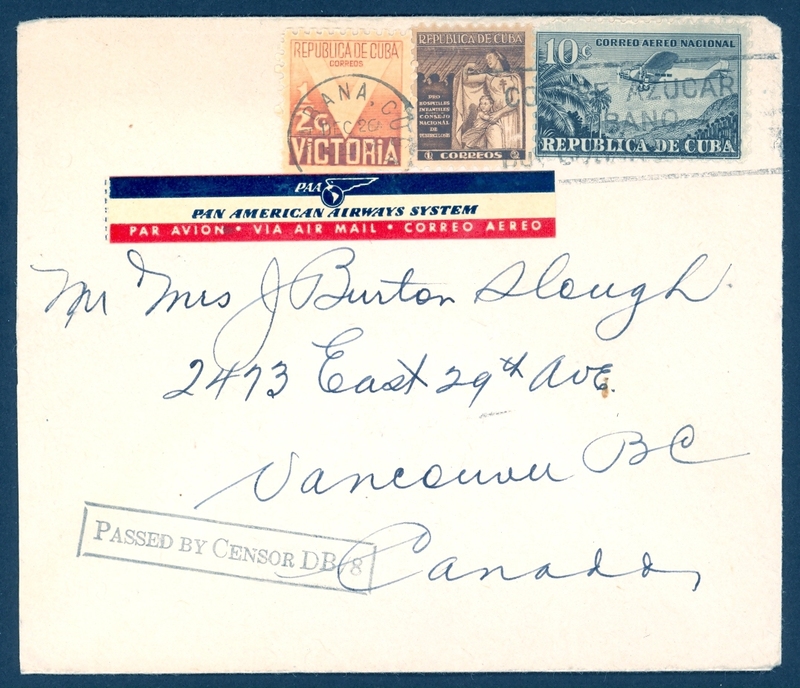 1161 Scott 310, RA5, RA7 Cuba to Richmond, VA, WWII US Censorship. 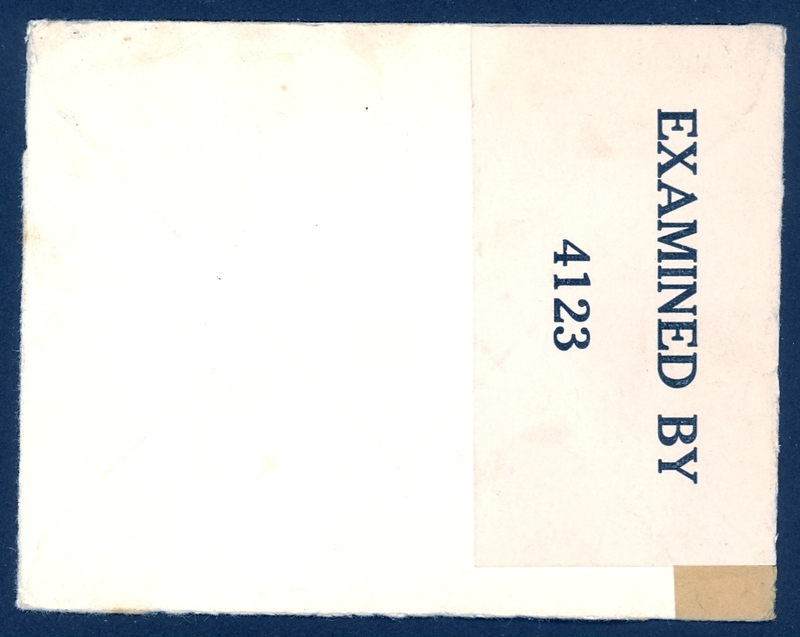 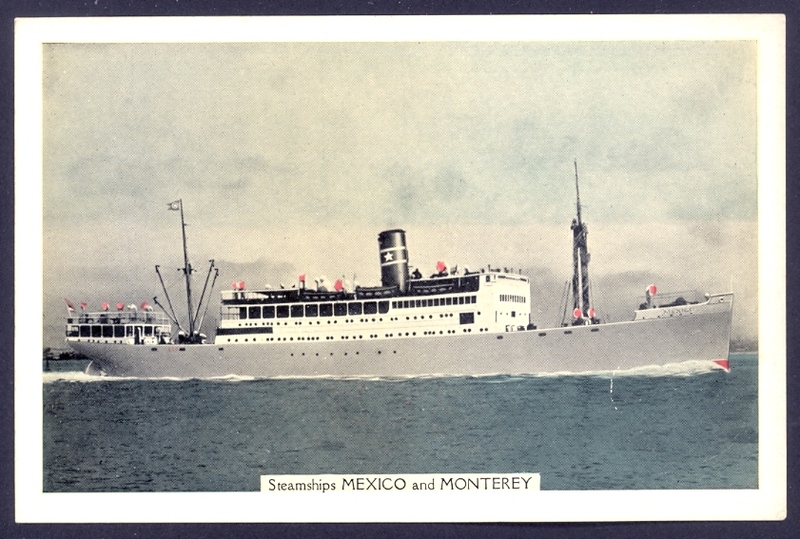 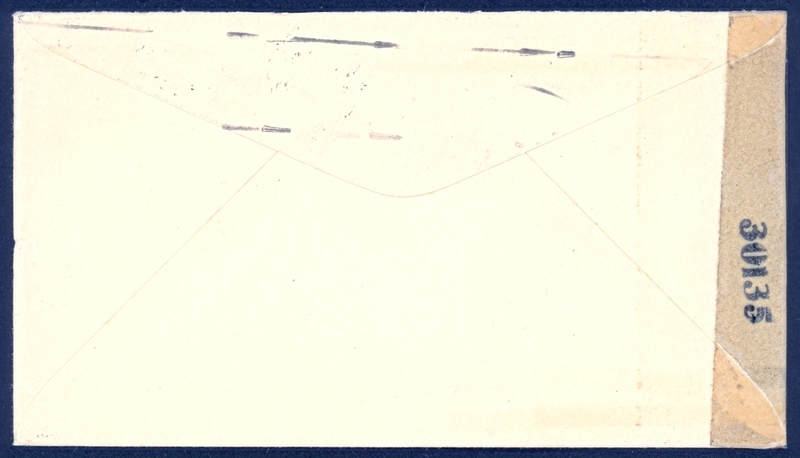 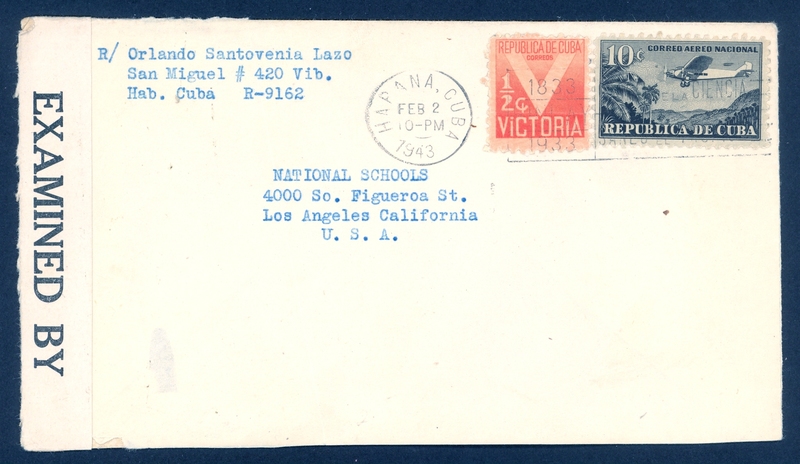 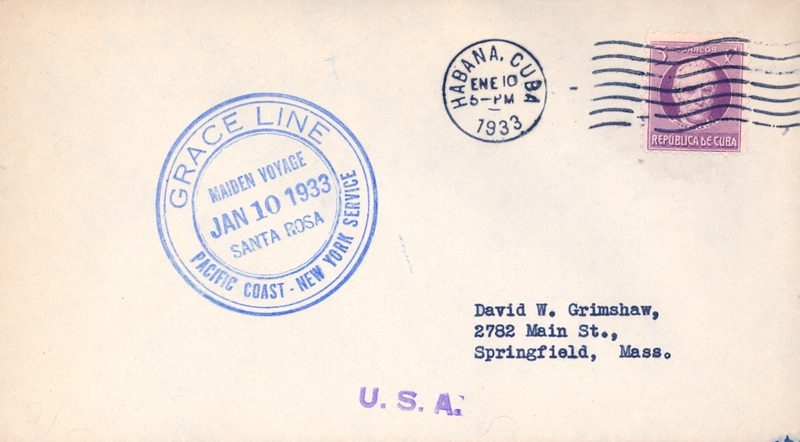 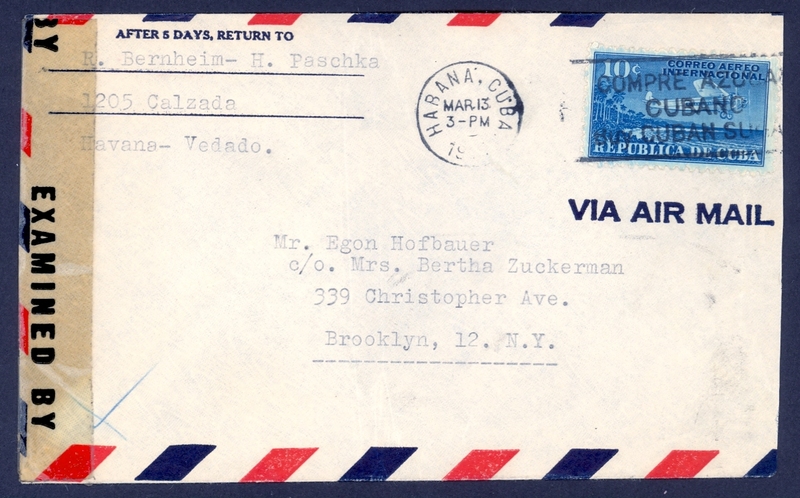 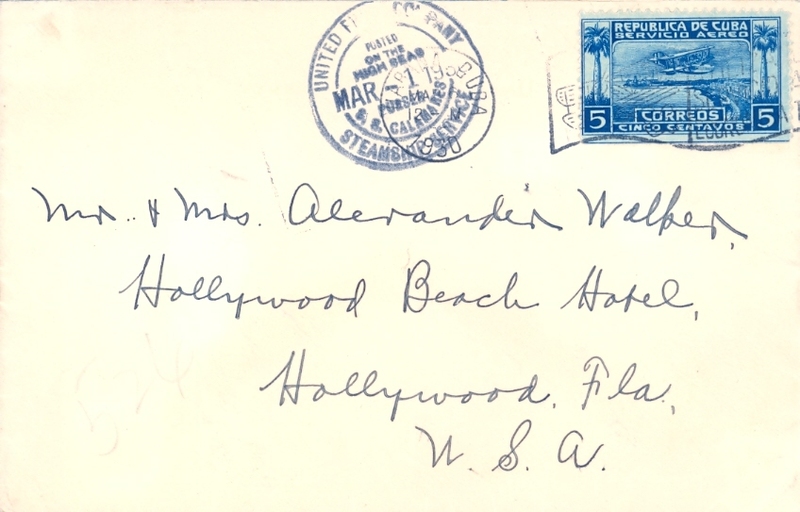 1162 Scott 310, RA5,RA7 Havana to California, WWII US Censorship. 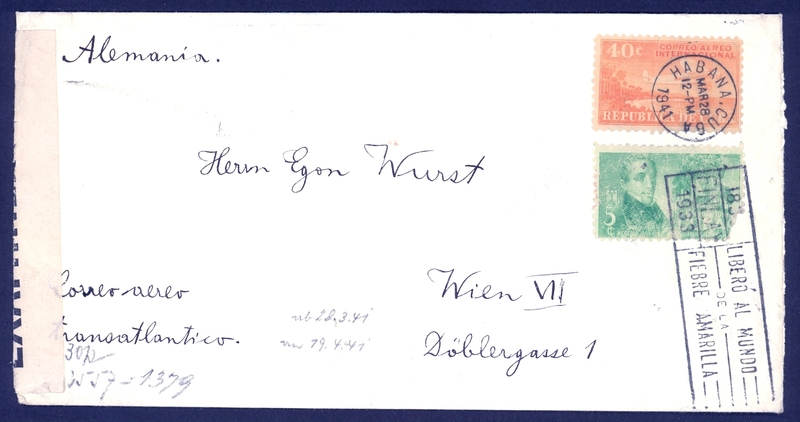 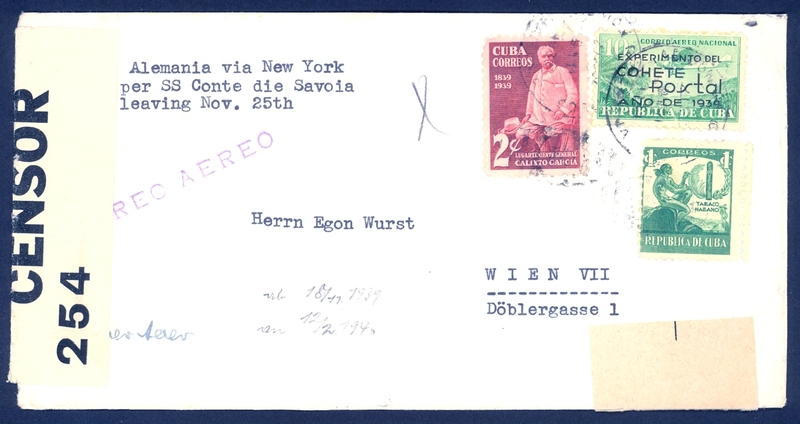 1163 Scott 356, 359, C31 Havana to Austria, WWII German Censorship. 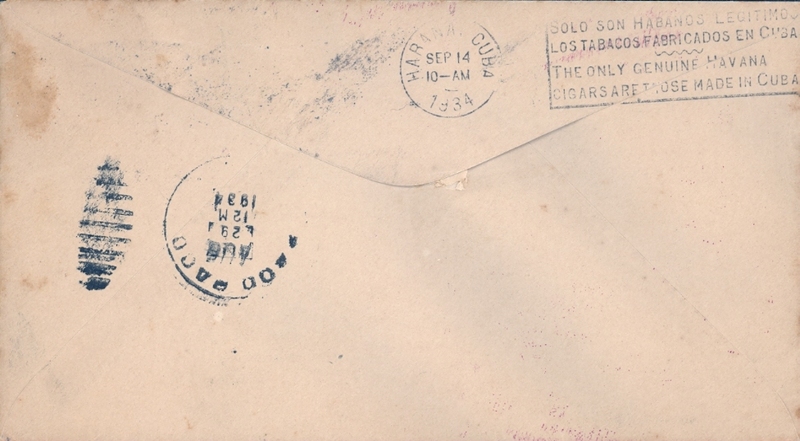 1166 Scott 373 WWII censored cover. 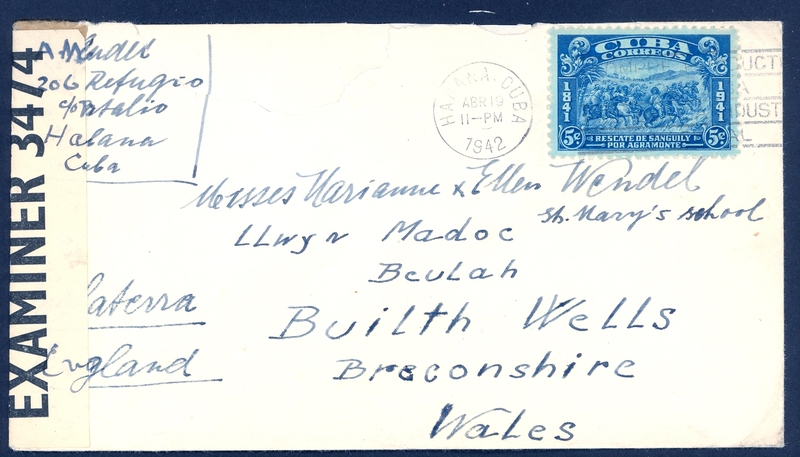 1167 Scott 374 Havana to Wales, 19 Apr 1942, Censored. 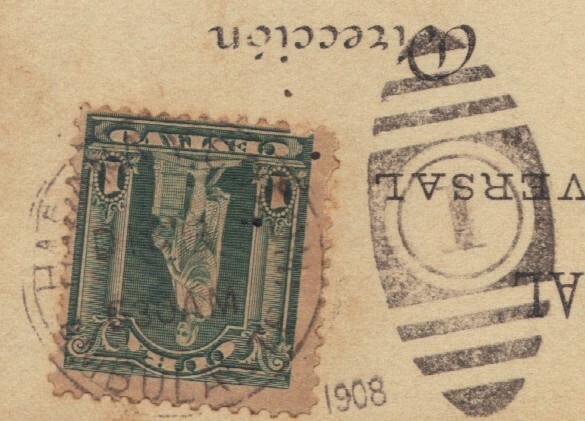 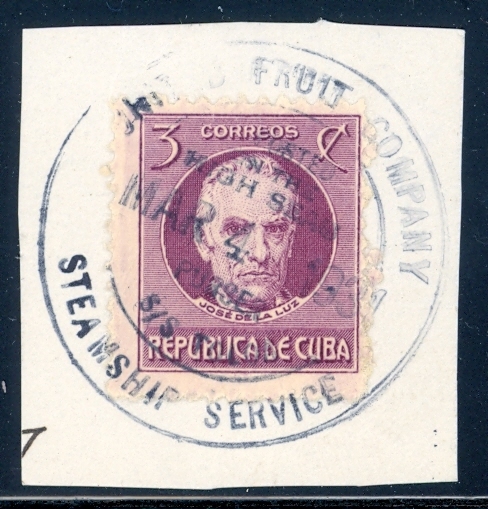 This stamp rare on cover. 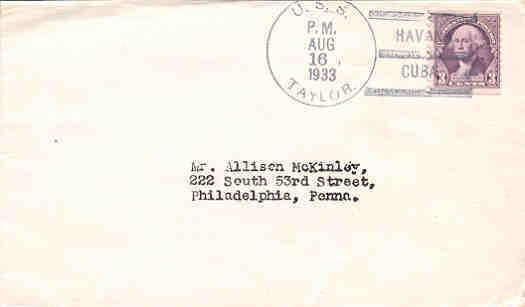 1168 Scott 377 (2) WWII censored cover. 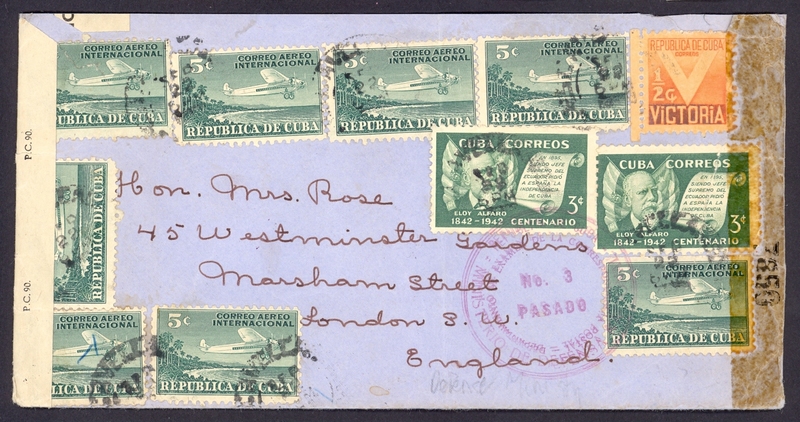 1169 Scott 380, C4(8), RA5 Camaguey to England, Cuban & British Censorship. 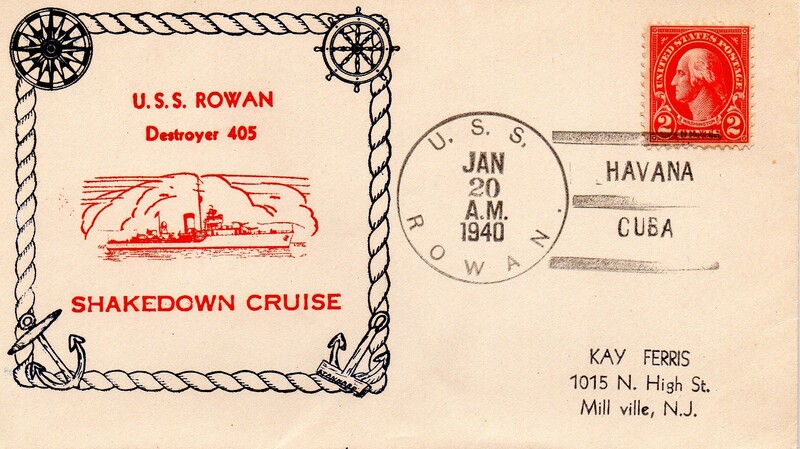 1171 Scott C4, RA5 Havana to Mississippi, WWII US Censorship. 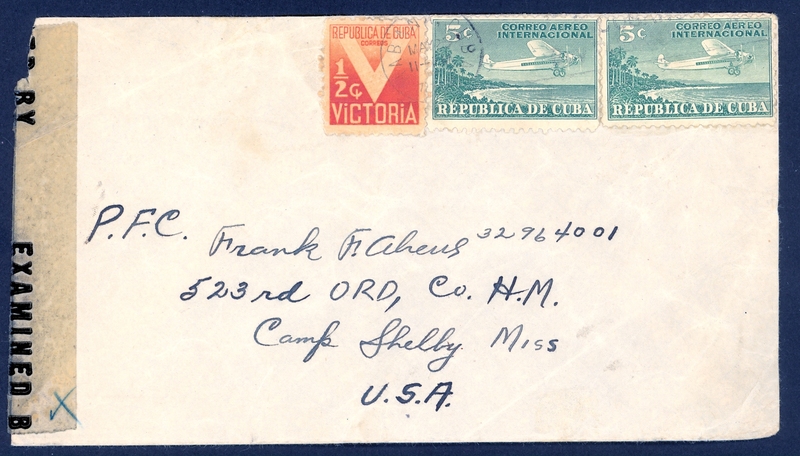 1172 Scott C5, RA5, RA7 Havana to NJ, WWII US Censorship..
1173 Scott C5, RA5, RA8 Santiago de Cuba to NYC, WWII US Censorship. 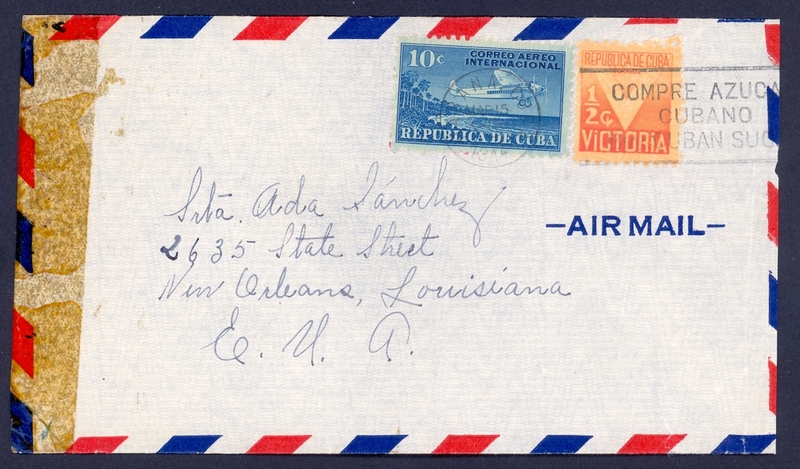 1174 Scott C5, RA5 Havana to New Orleans, WWII US Censorship. 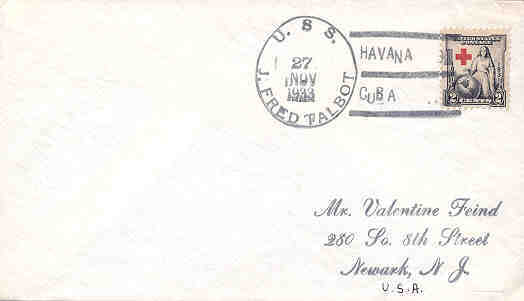 1175 Scott C5, RA5 Havana to NYC, WWII US Censorship. 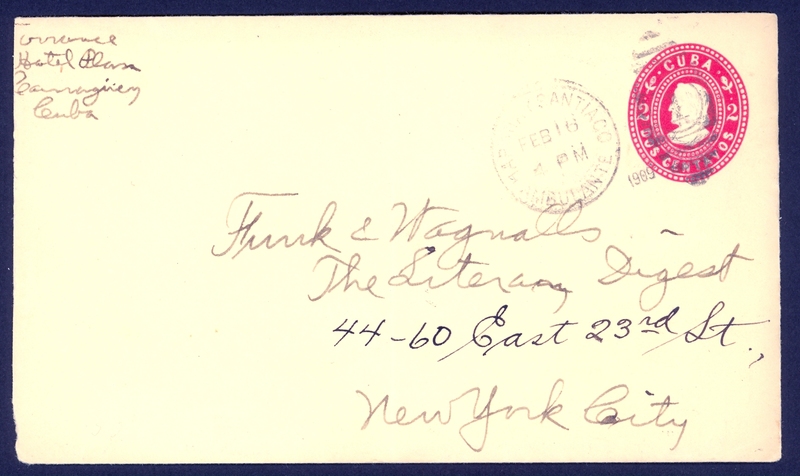 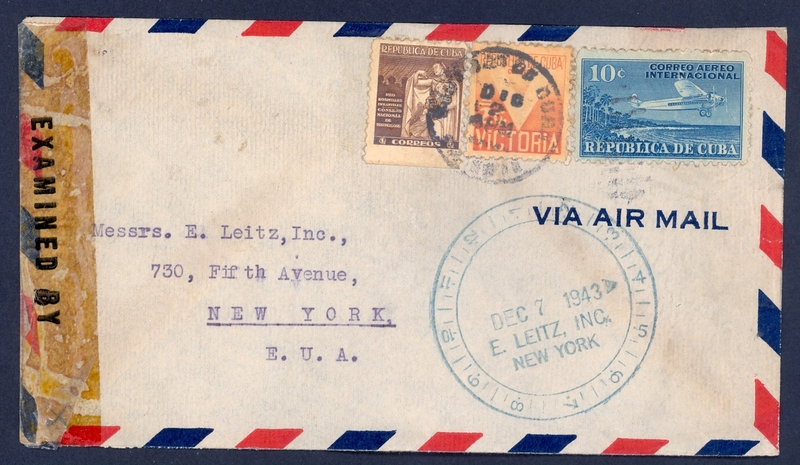 1176 Scott C5 Havana to Brooklyn, NY, WWII US Censorship. 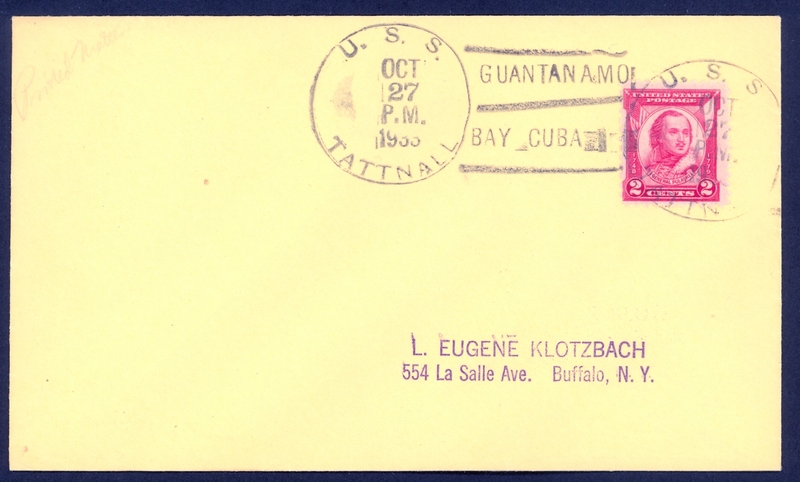 1177 Scott C5 Havana to Connecticut, WWII US Censorship. 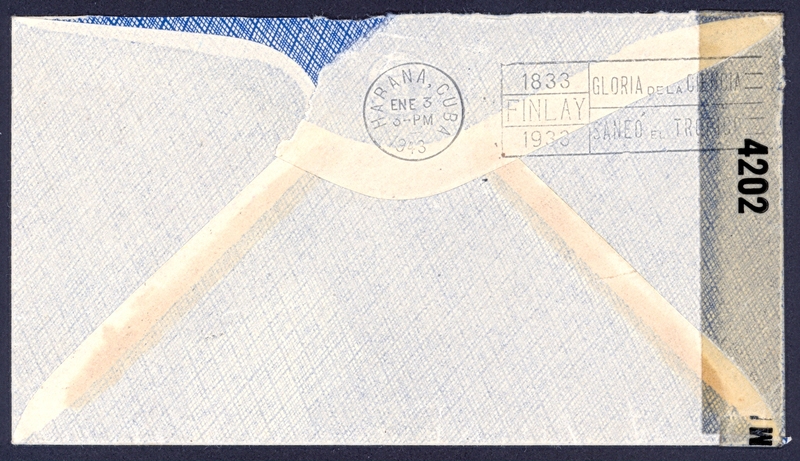 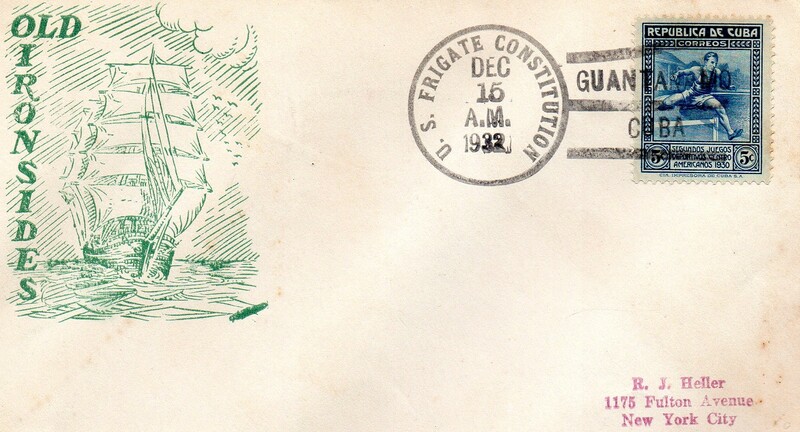 1178 Scott C5, RA5 WWII censored cover. 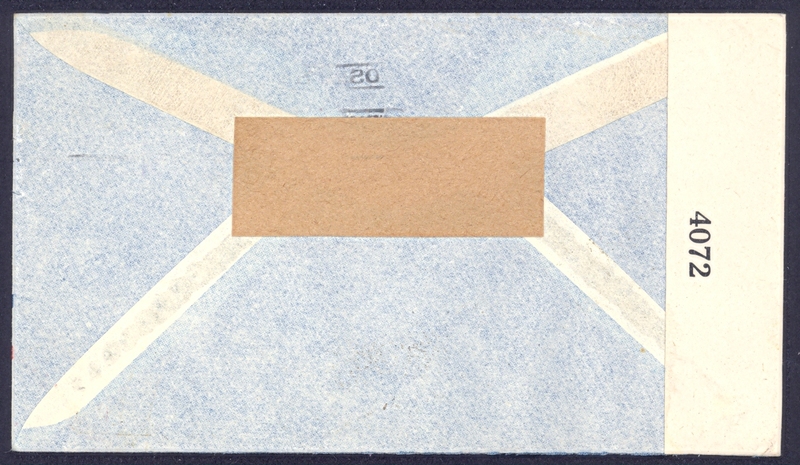 1179 Scott C5 WWII censored co\ ver. 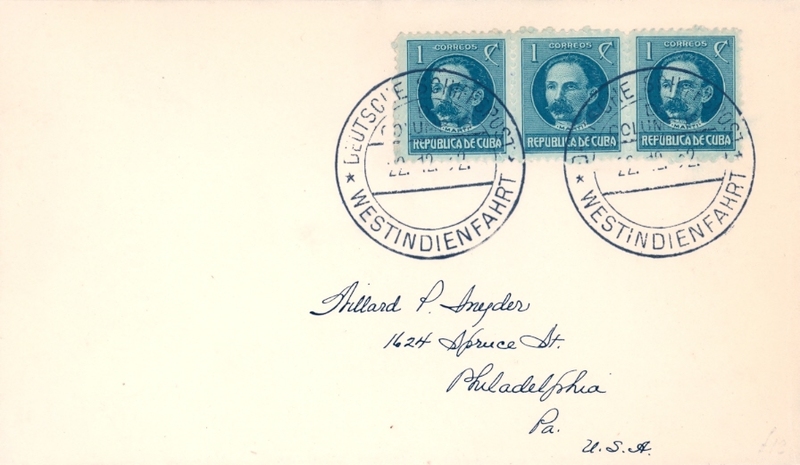 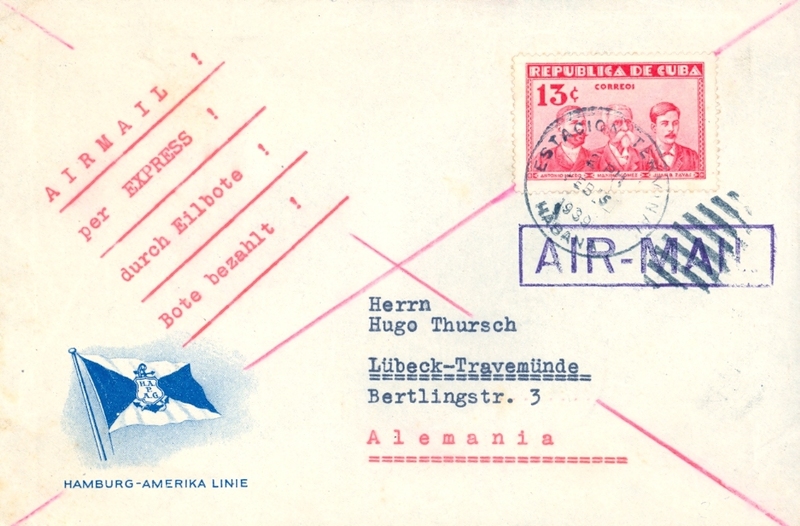 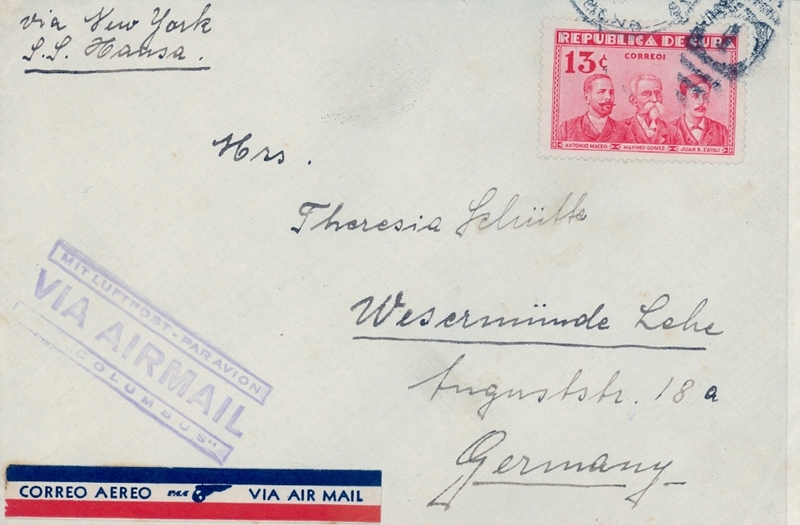 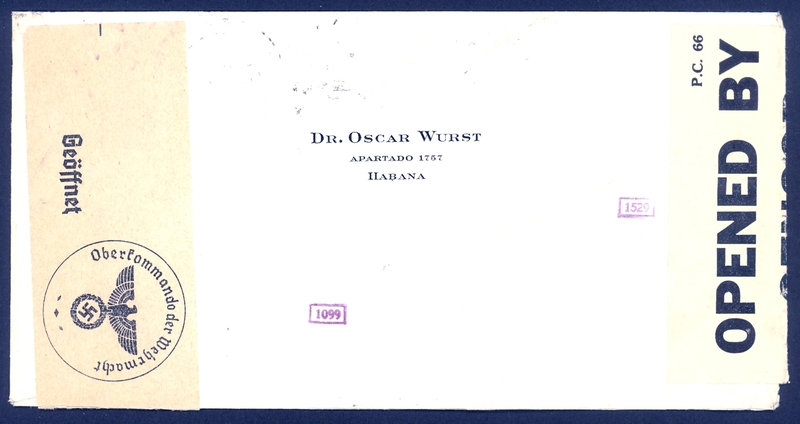 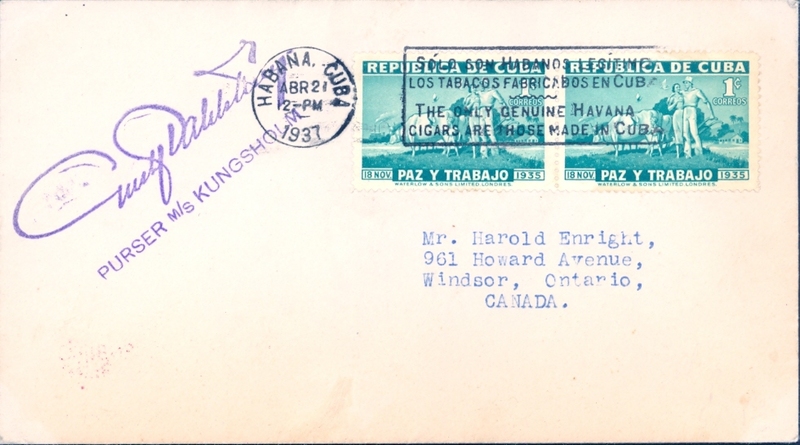 1180 Scott C9, C34 Havana to Germany, WWII German Censorship. 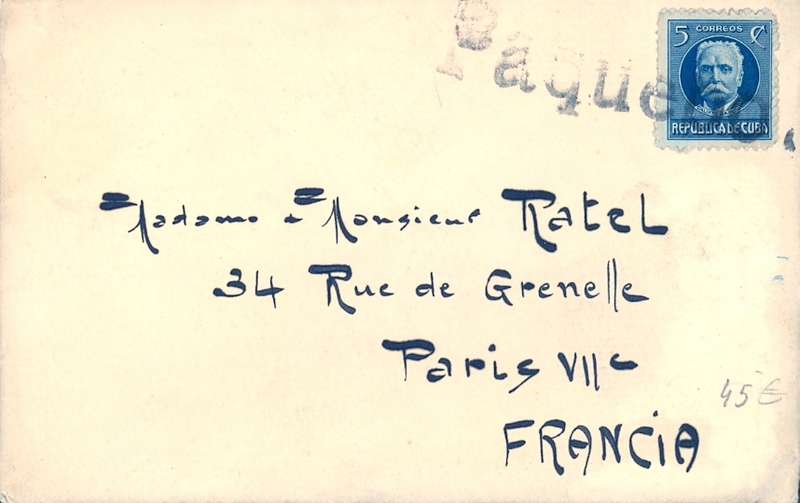 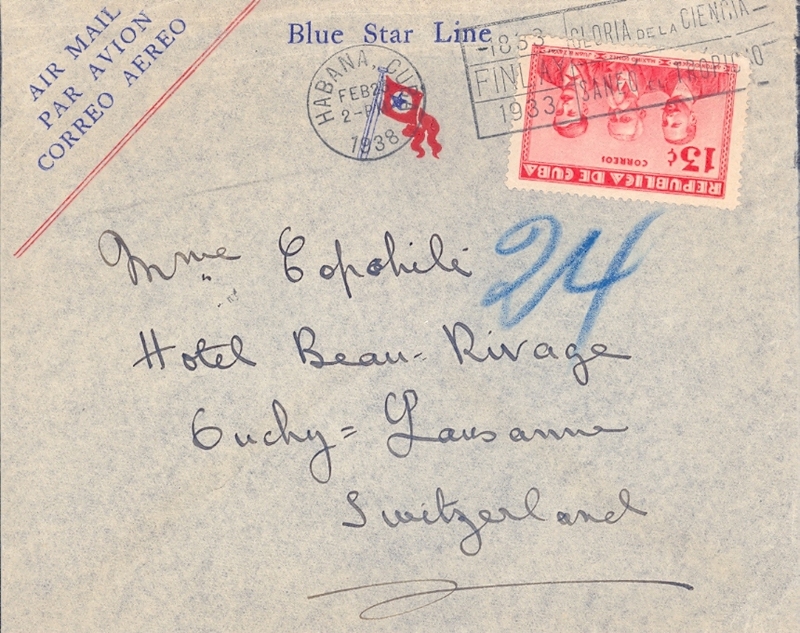 1181 Scott C12, C14(2) Havana to Switzerland, WWII US Censorship. 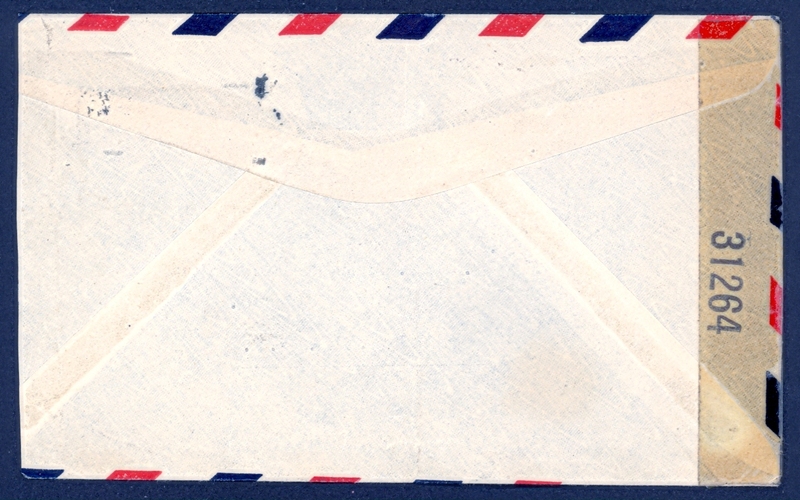 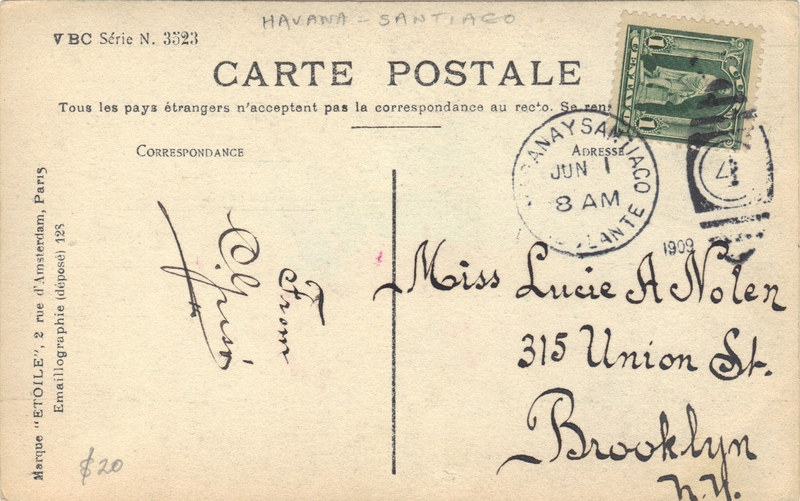 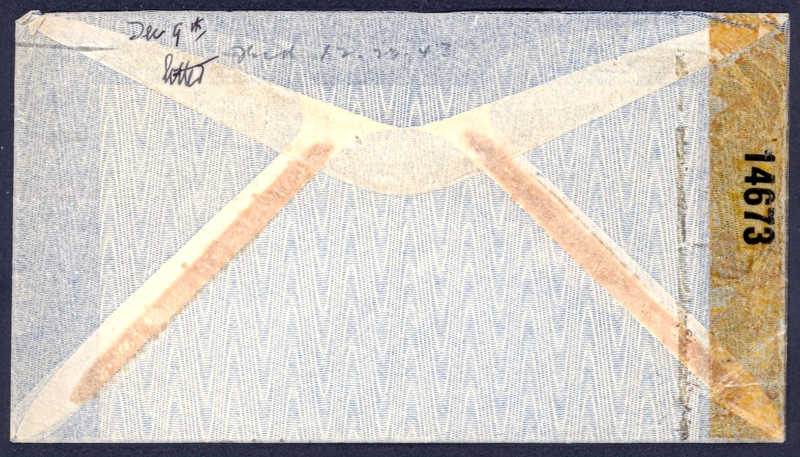 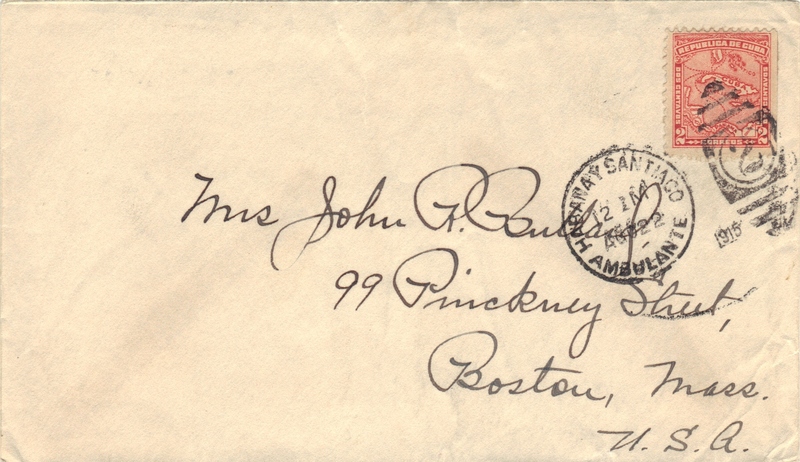 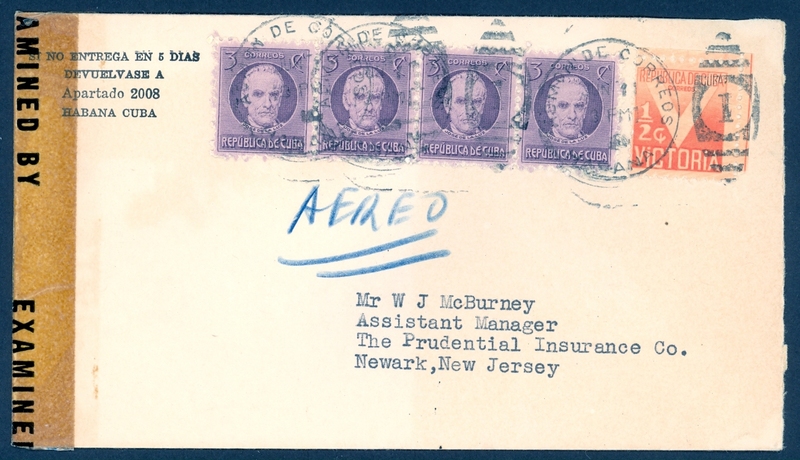 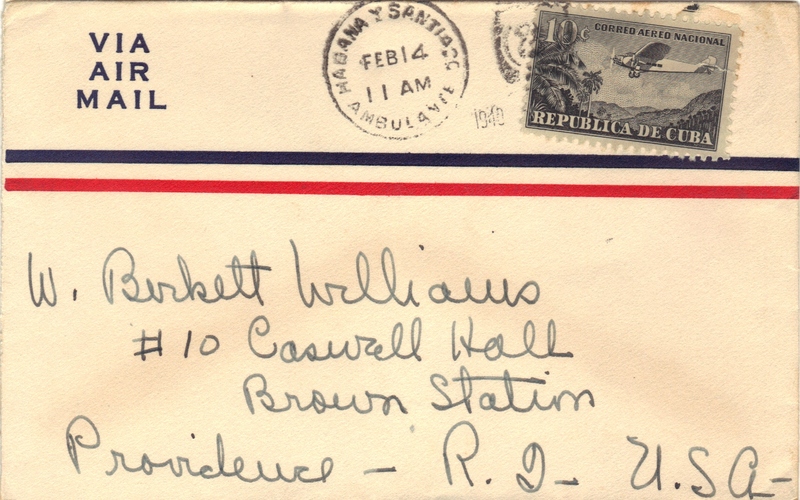 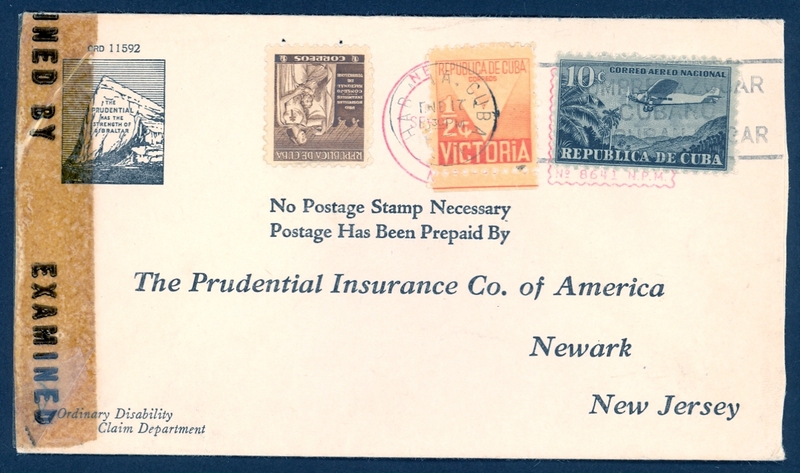 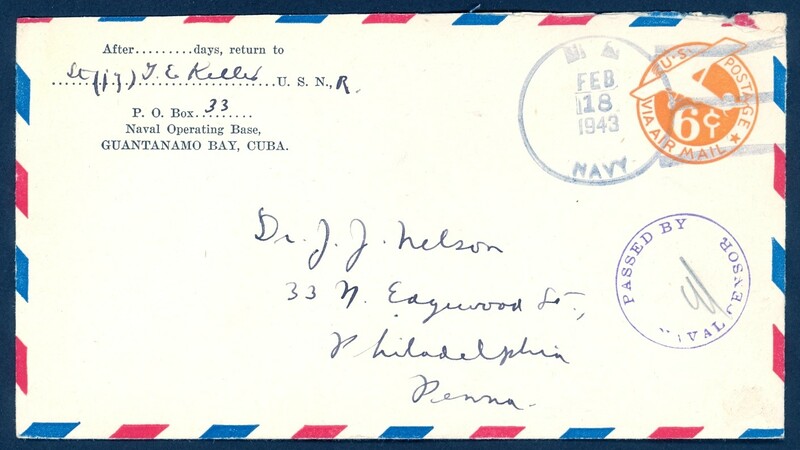 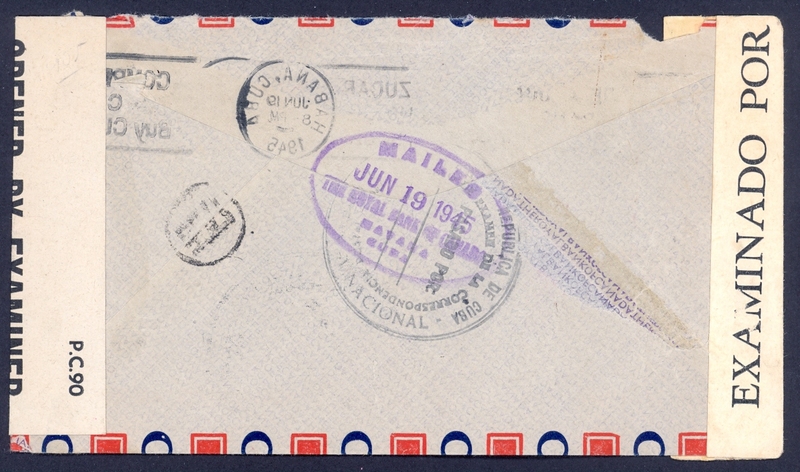 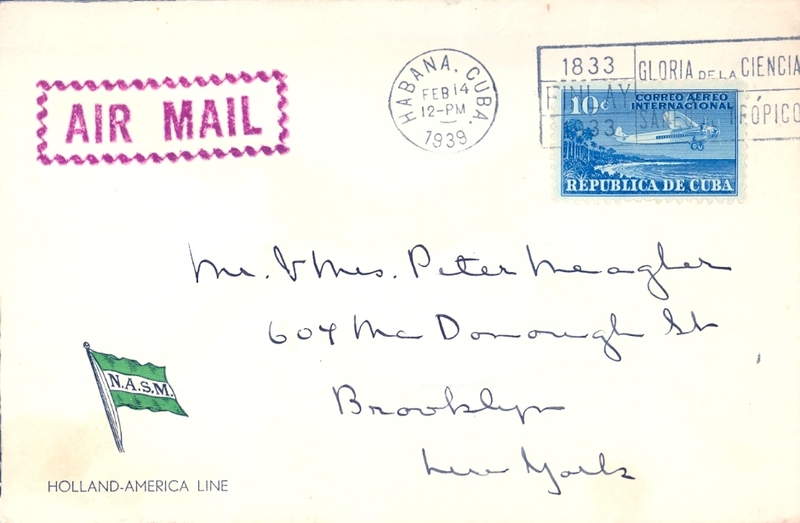 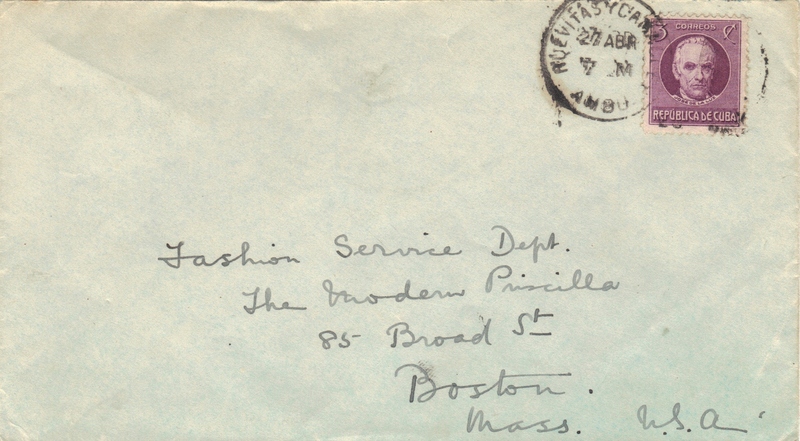 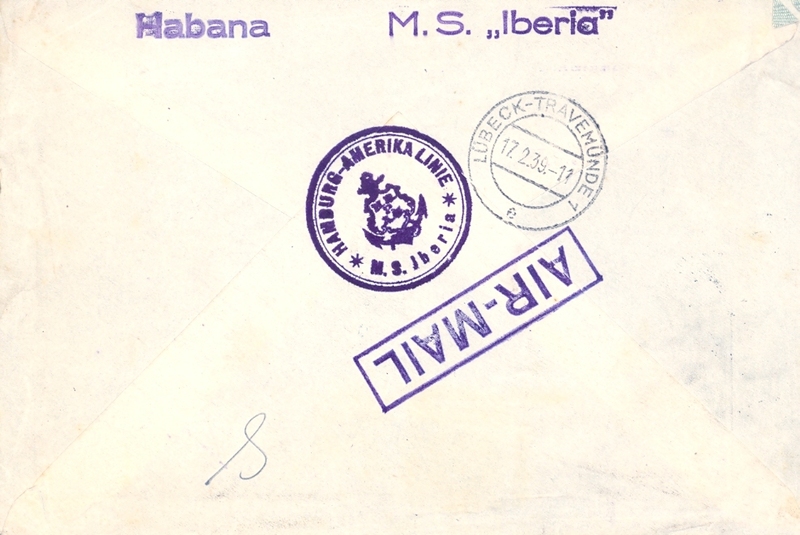 1183 Scott C13, RA5, RA8 Havana to NJ, WWII US Censorship. 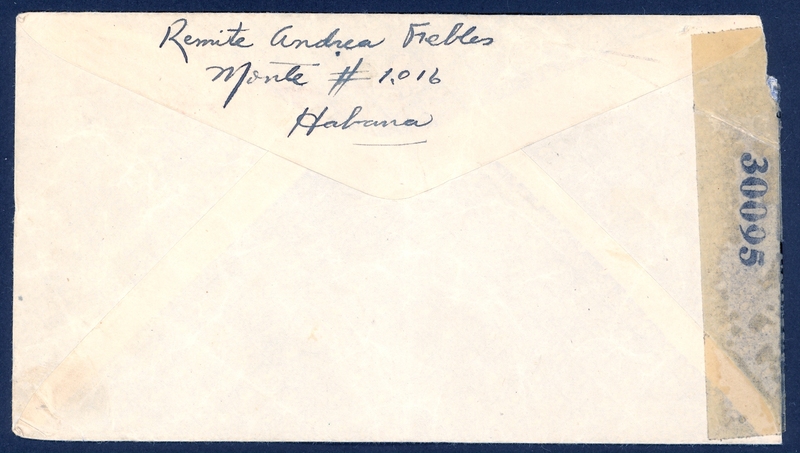 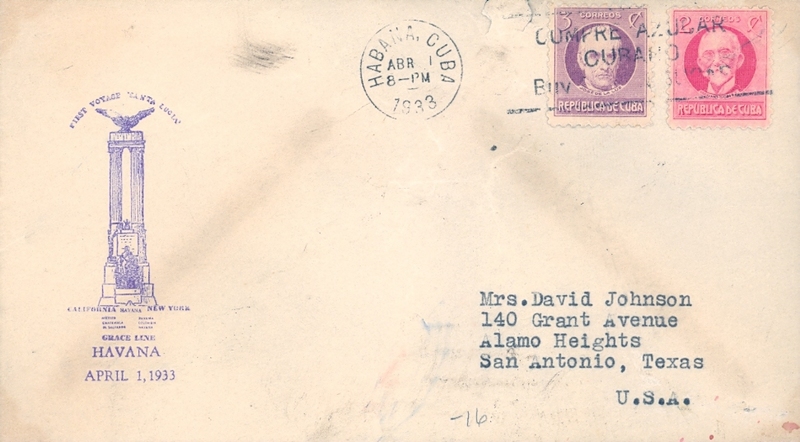 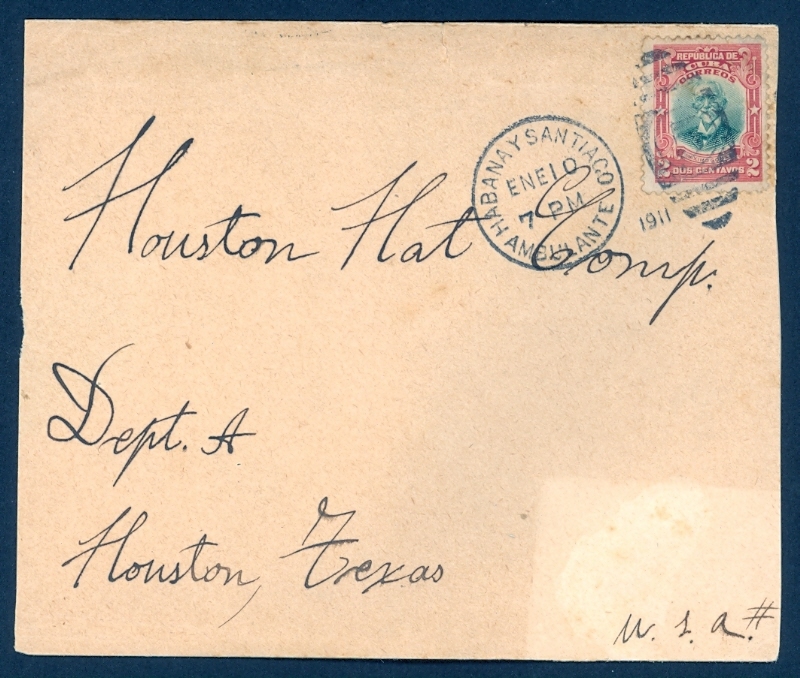 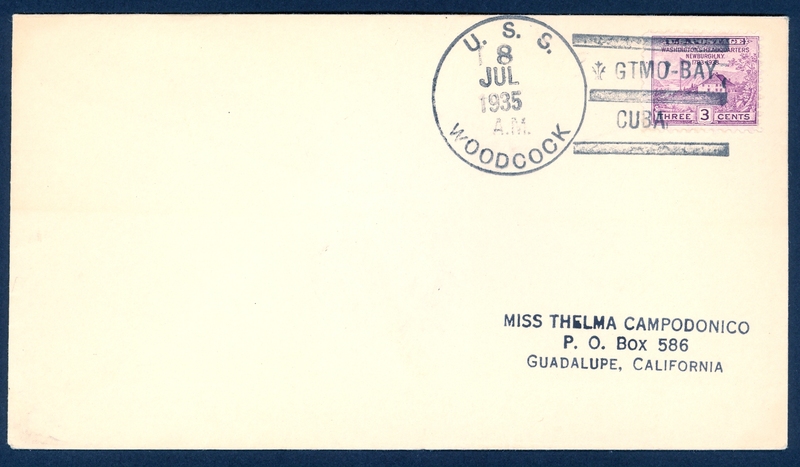 1184 Scott C13, RA5, RA8 Havana to Texas, WWII US Censorship. 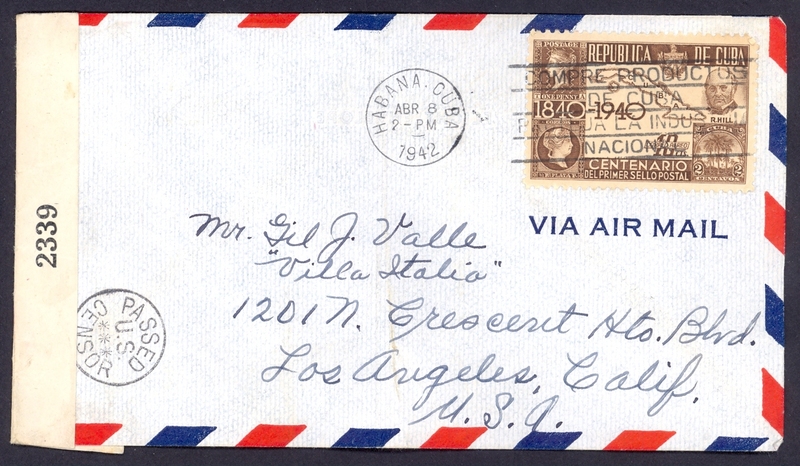 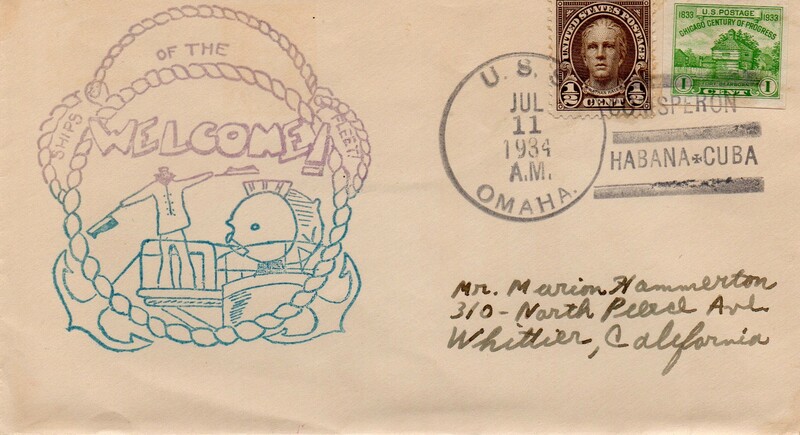 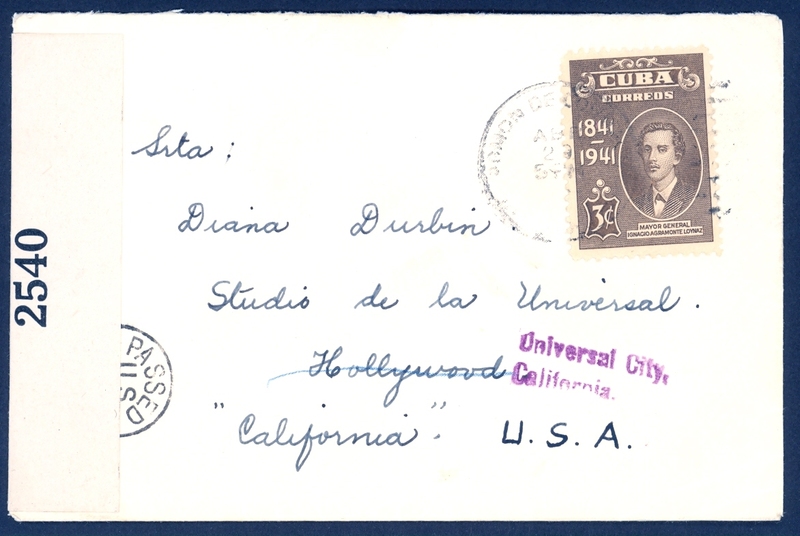 1185 Scott C13, RA5 Havana to Los Angeles, WWII US Censorship. 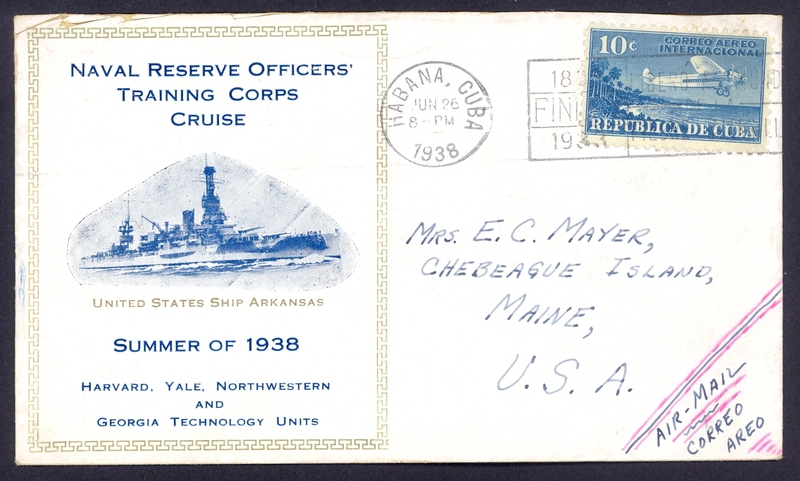 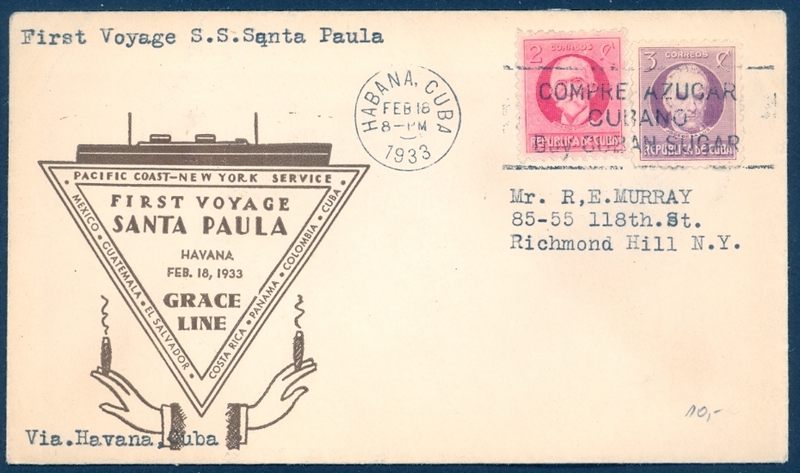 1186 Scott C32, RA5 Havana to NYC, WWII US Censorship. 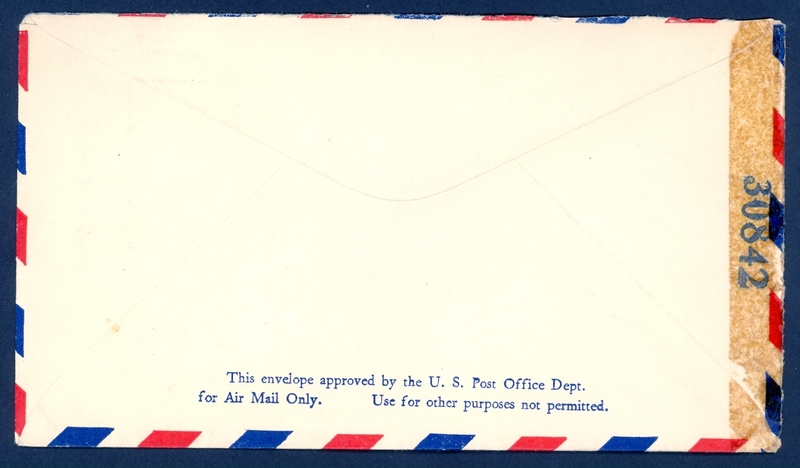 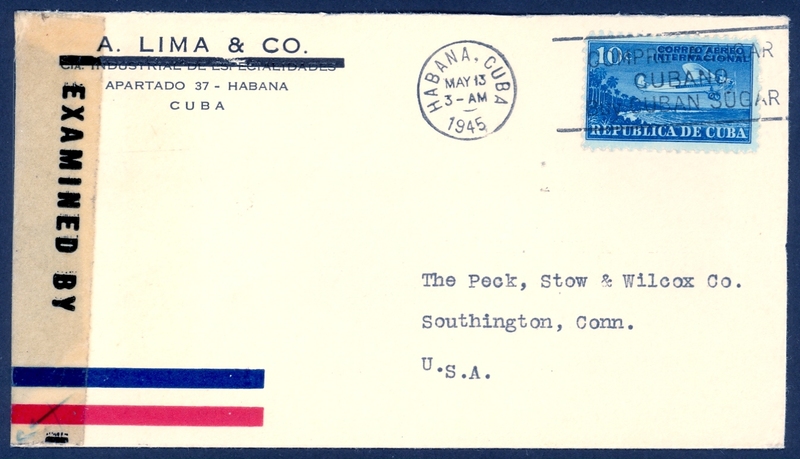 1187 Scott C32, RA5 Havana to Washington, DC, WWII US Censorship. 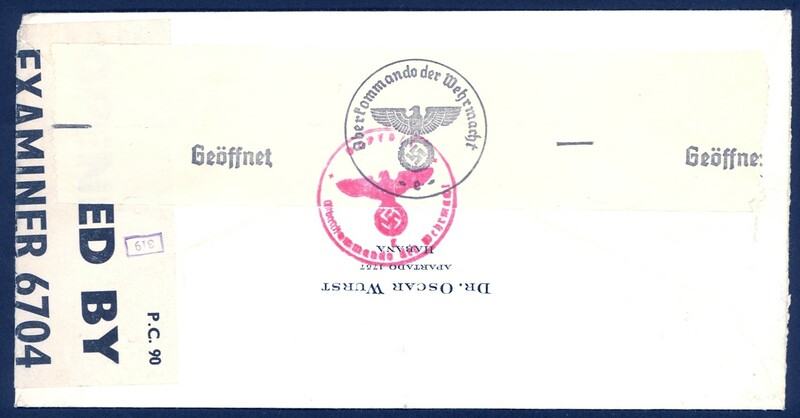 1188 Scott C32 WWII censored cover. 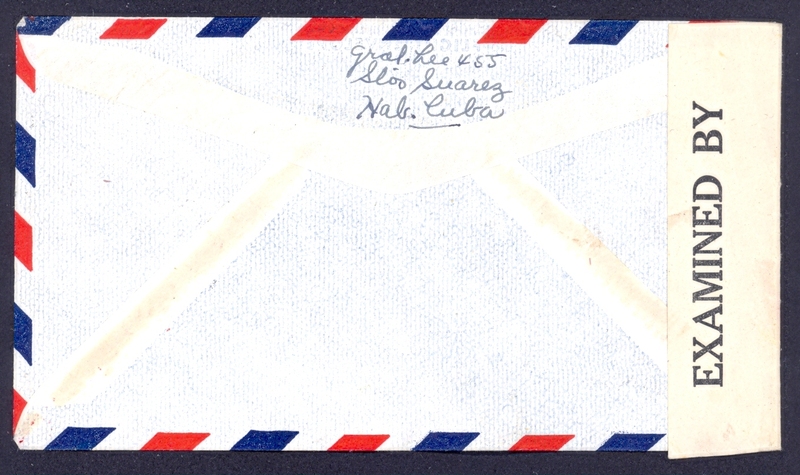 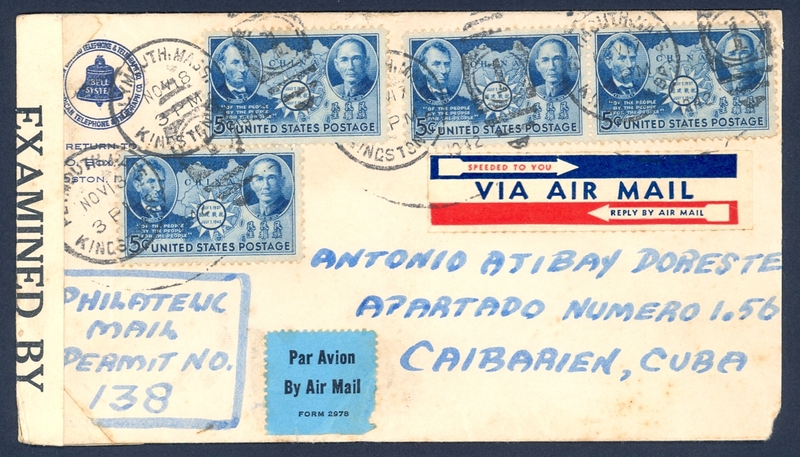 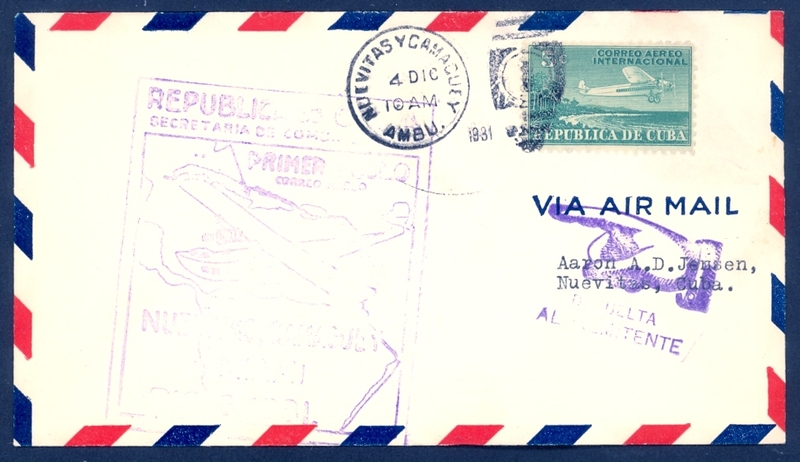 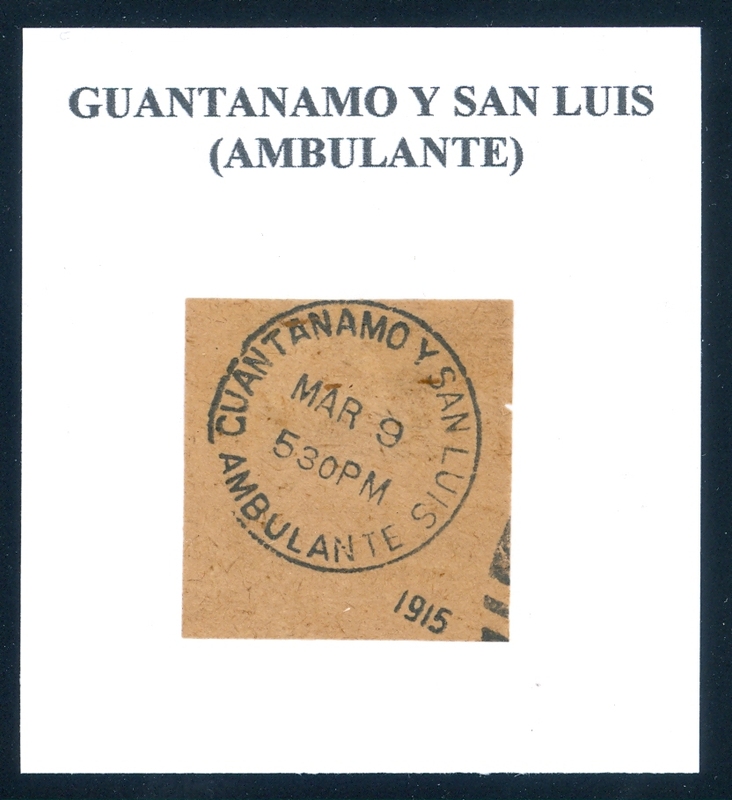 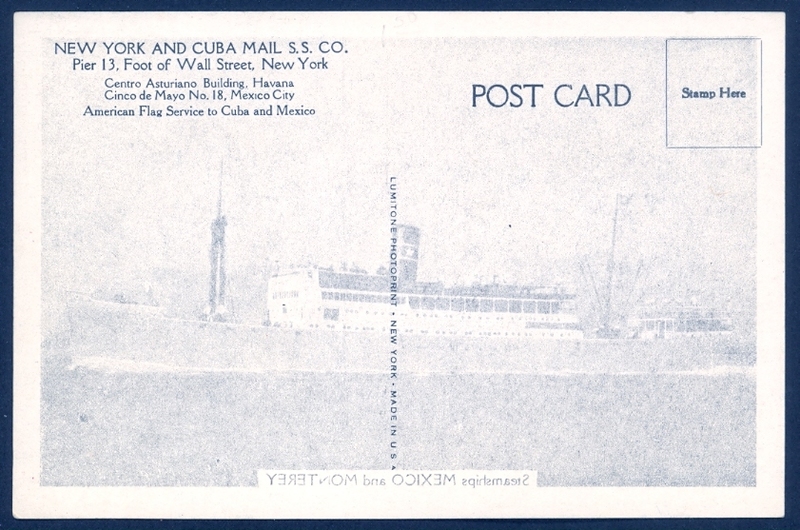 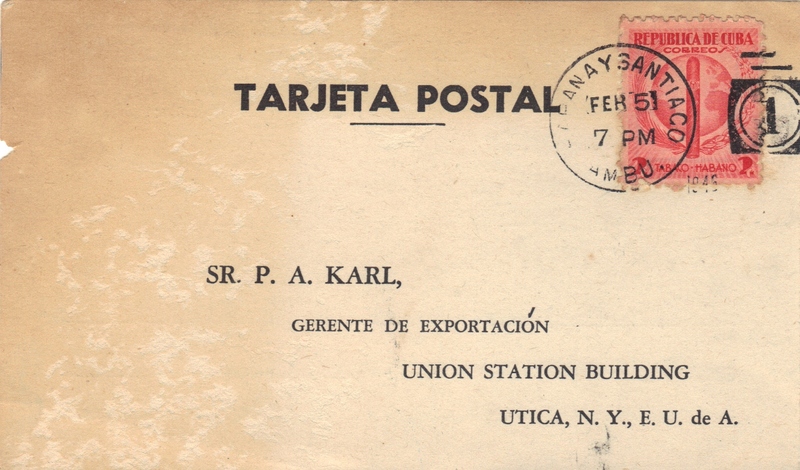 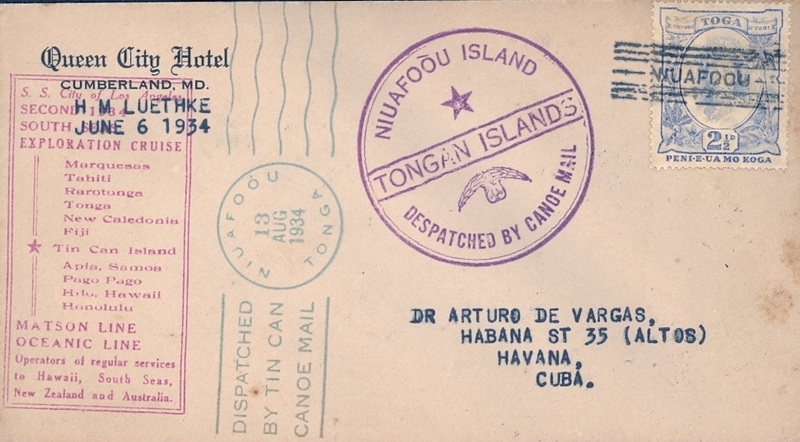 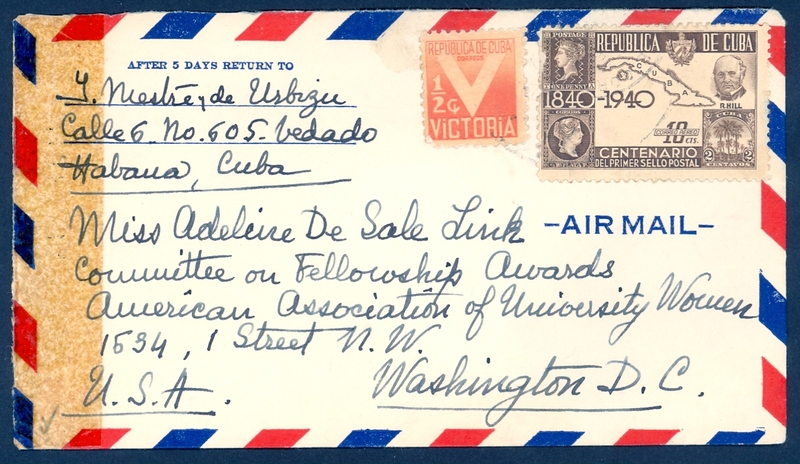 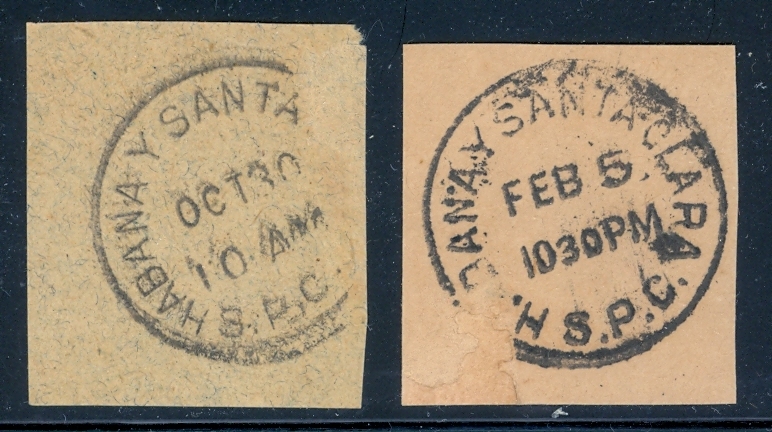 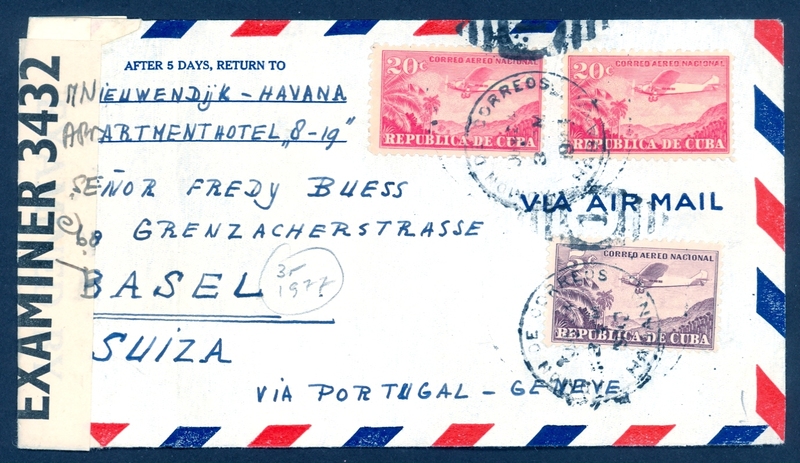 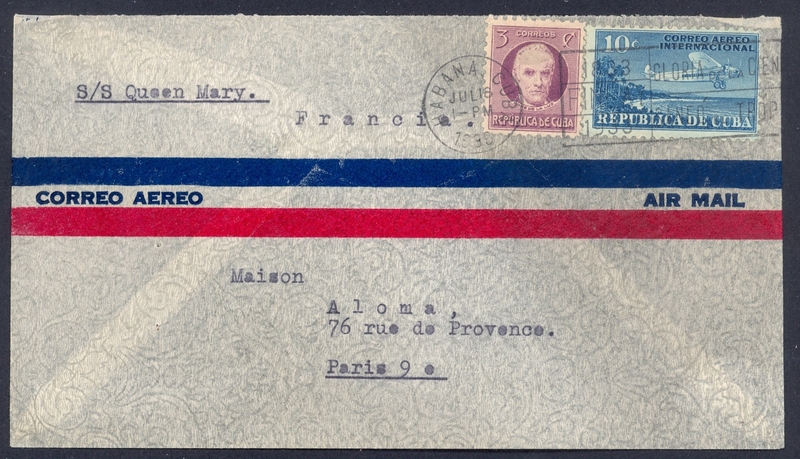 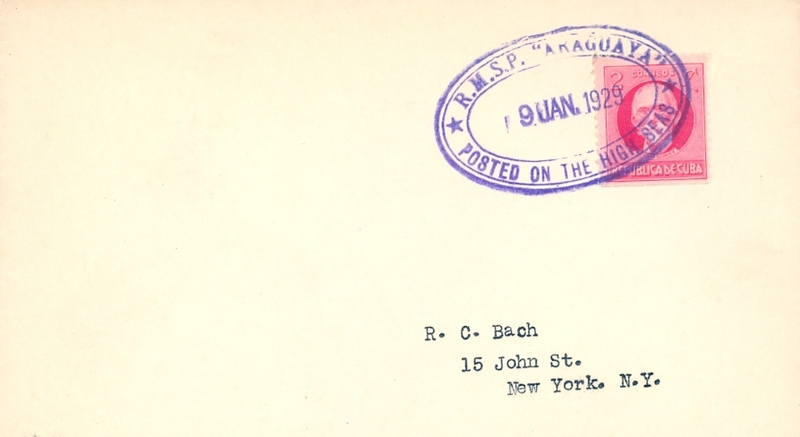 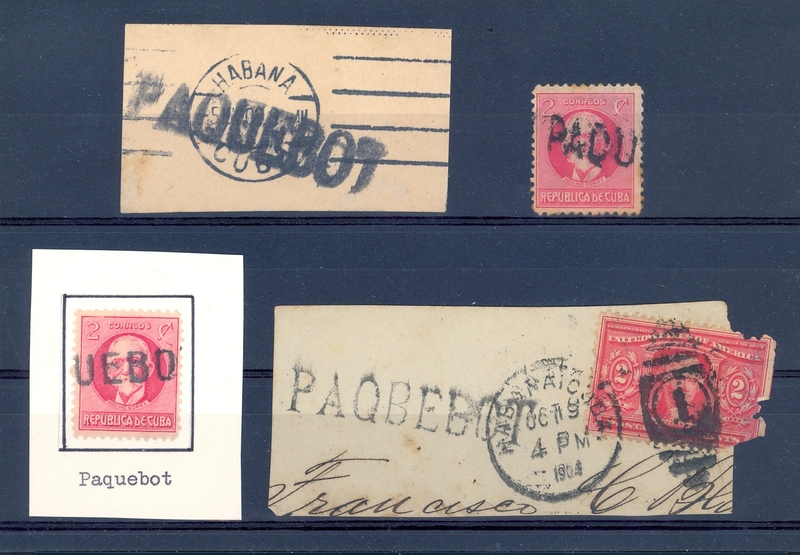 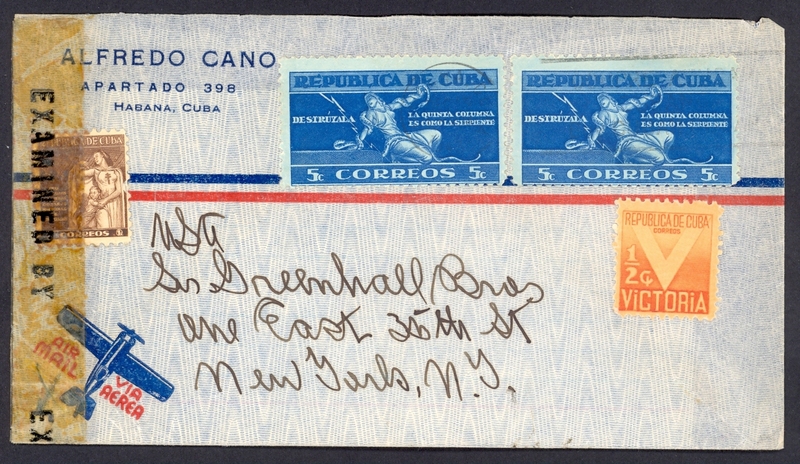 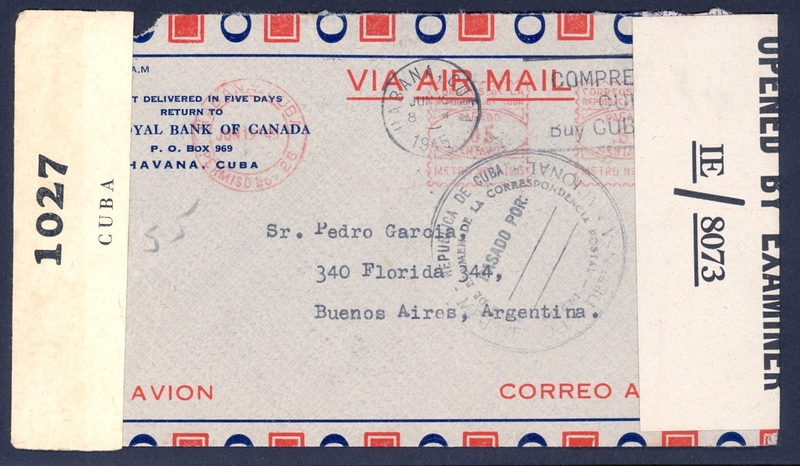 1192 Meter postage Havana to Argentina, WWII Cuban & US Censorship. 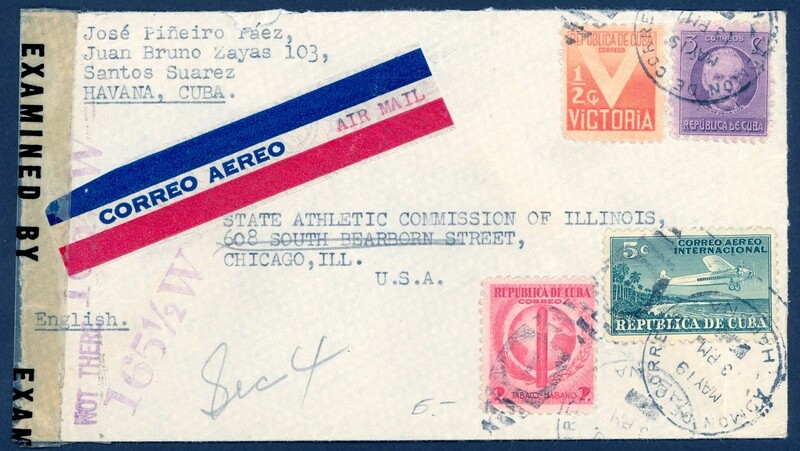 1193 - Havana to Chicago, WWII US Censorship. 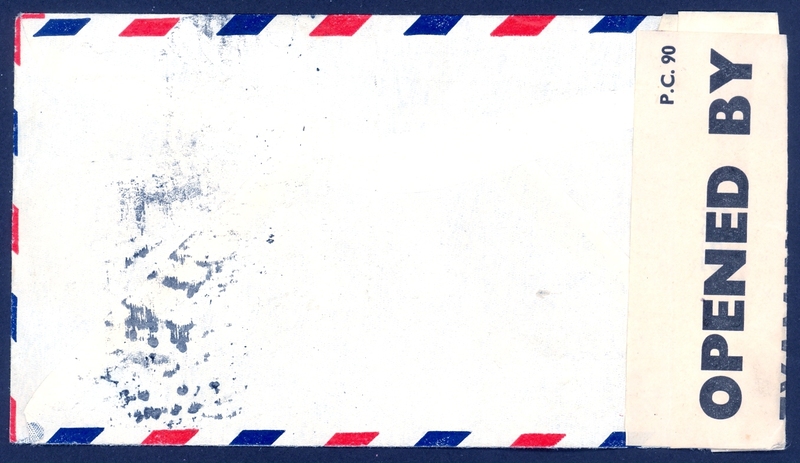 Marked "Undeliverable-not-there". 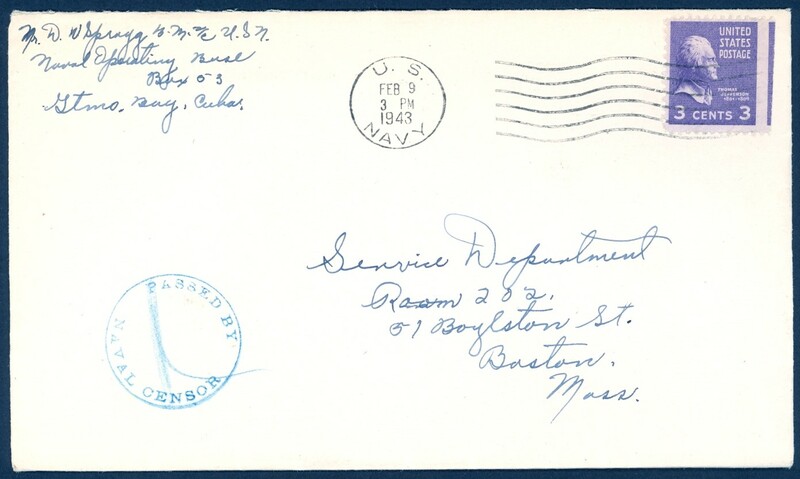 1194 - Plymouth, Mass. 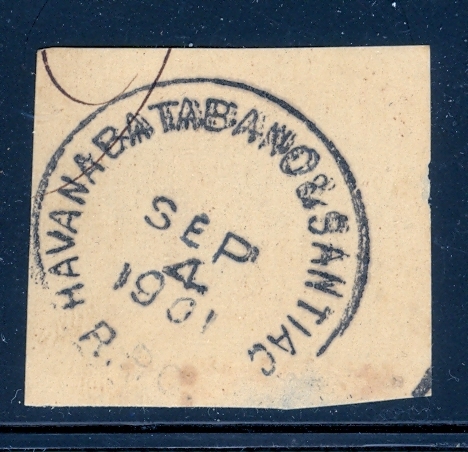 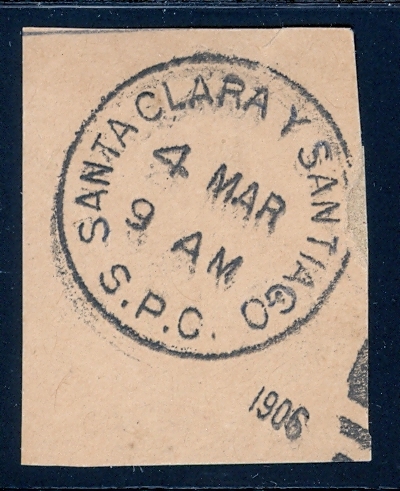 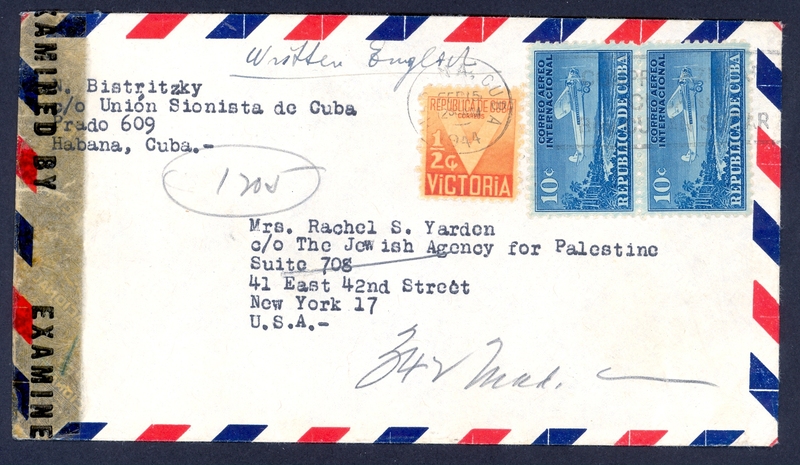 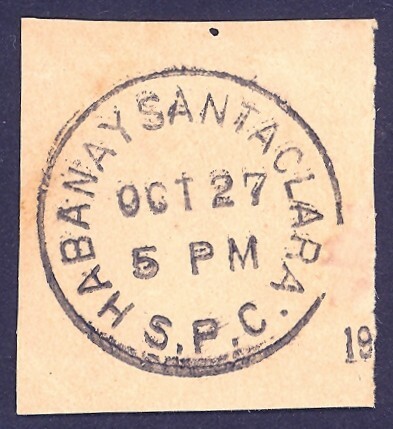 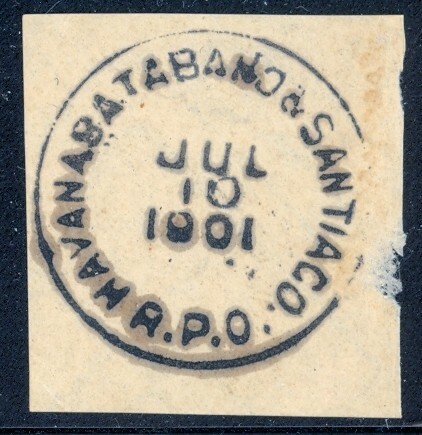 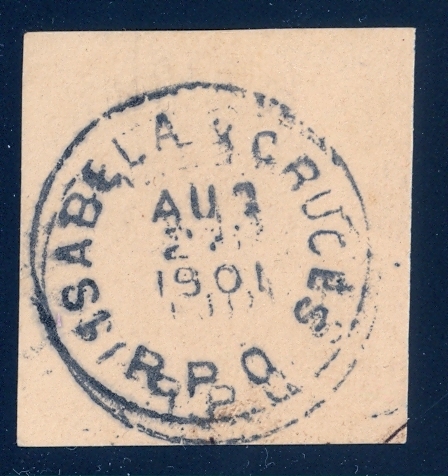 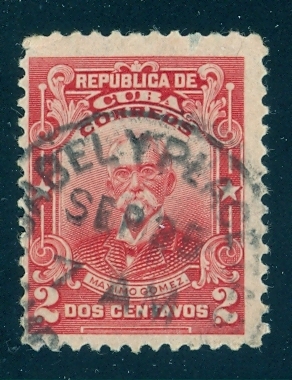 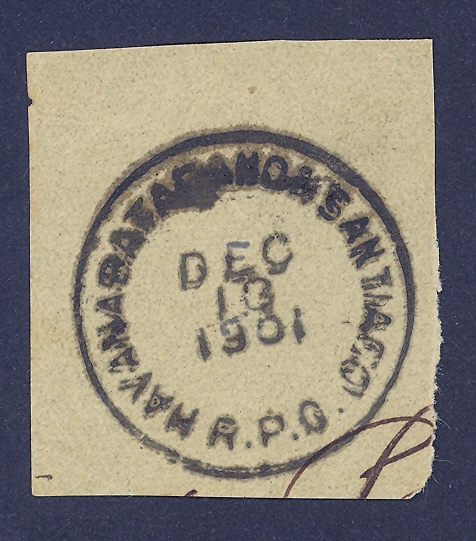 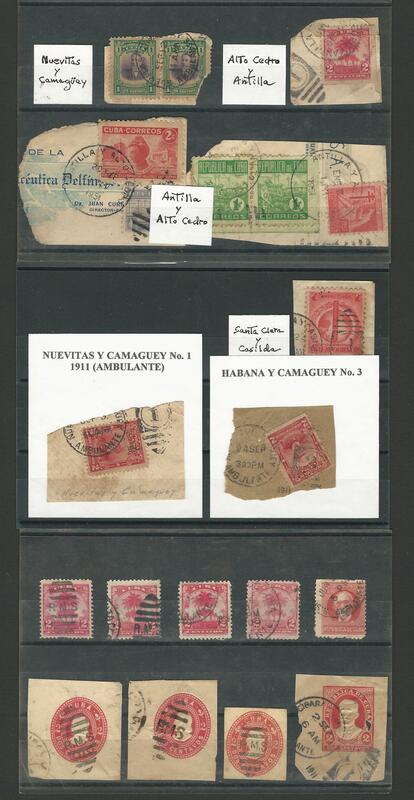 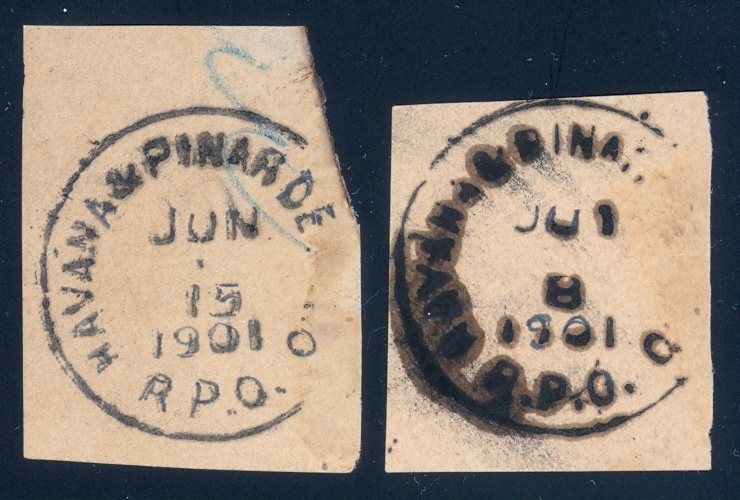 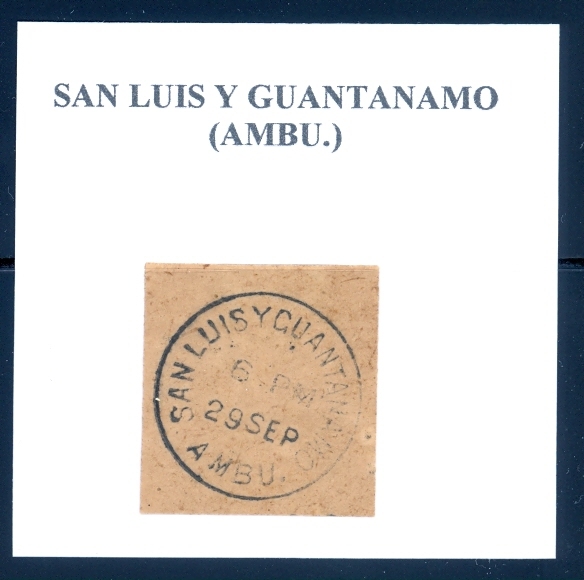 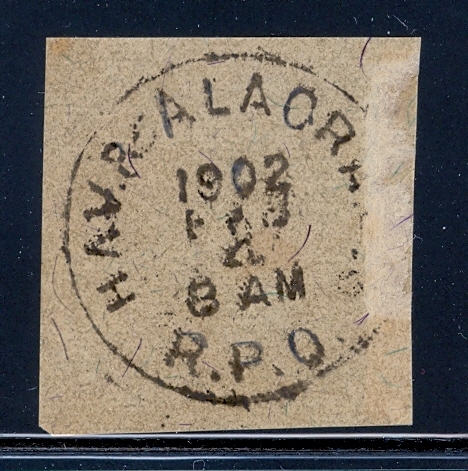 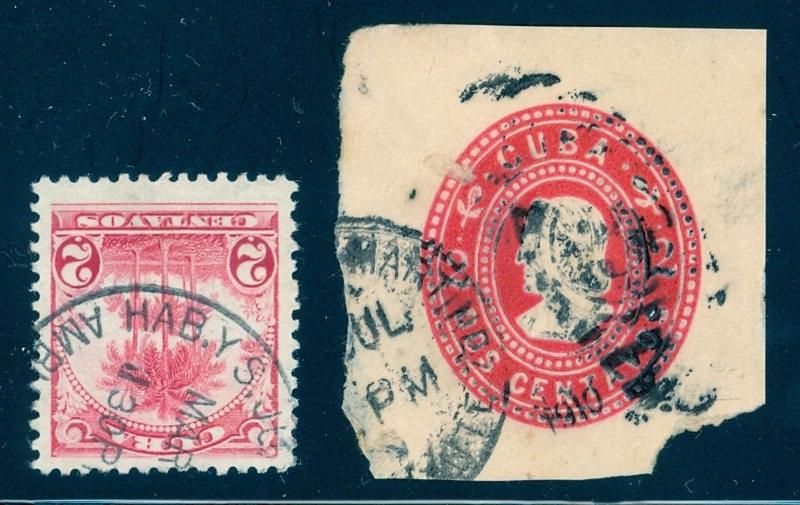 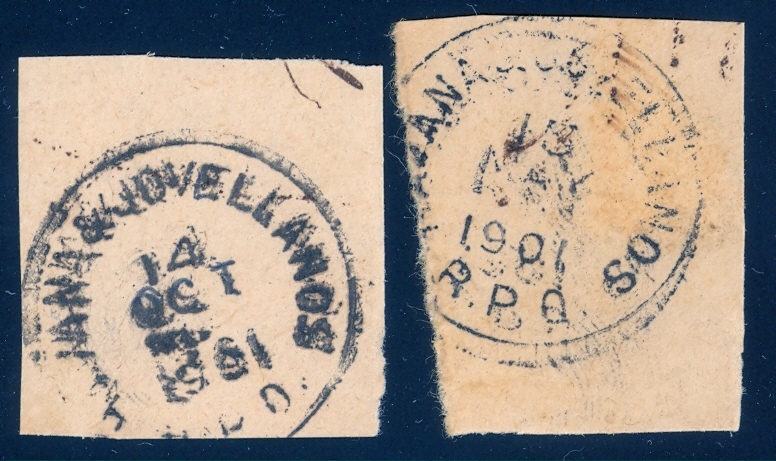 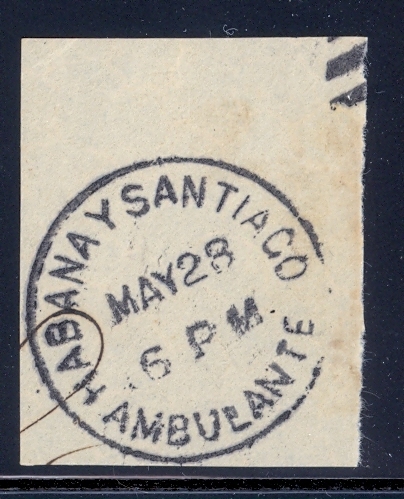 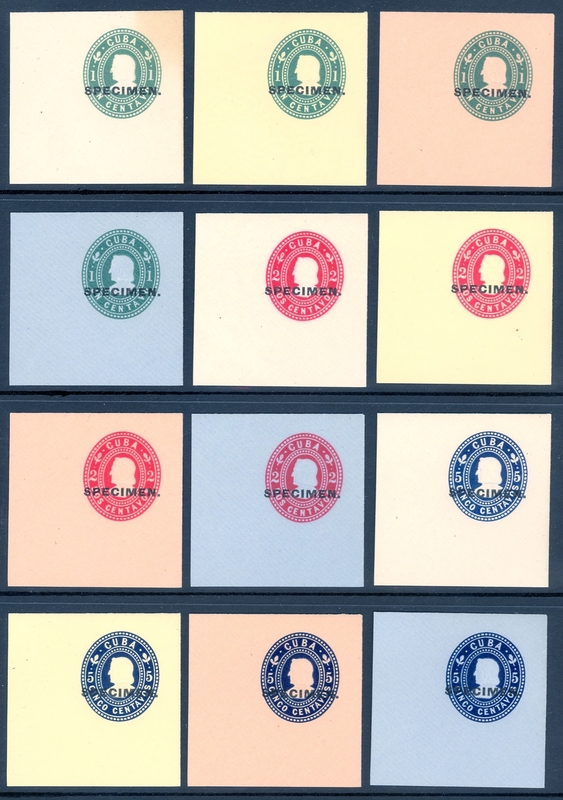 to Caibarien, Cuba, Philatelic Permit No. 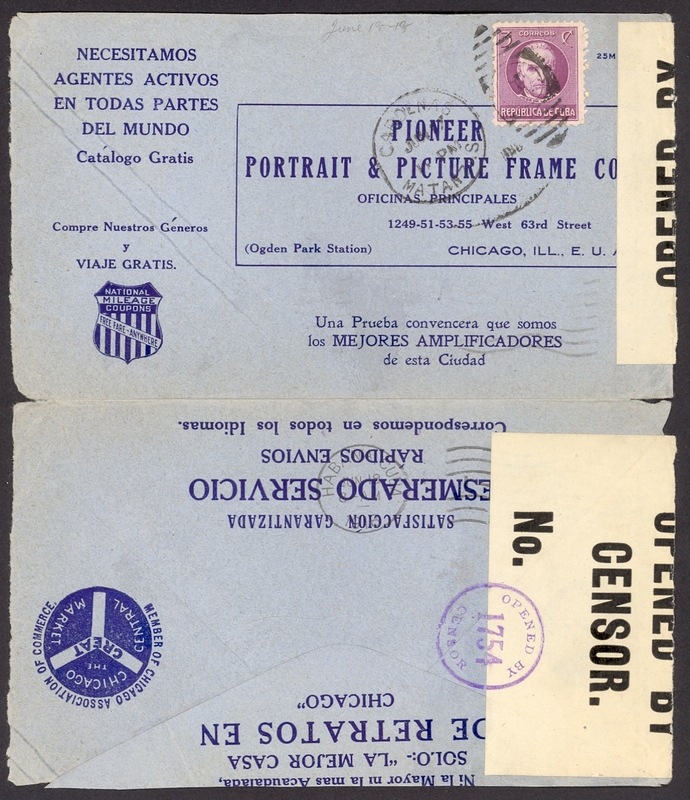 138, WWII US Censorship.